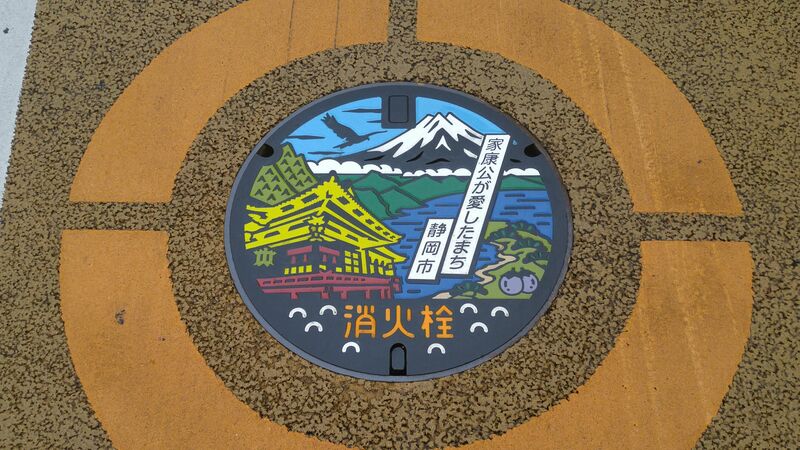 Shizuoka Gastronomy on Manhole Covers! 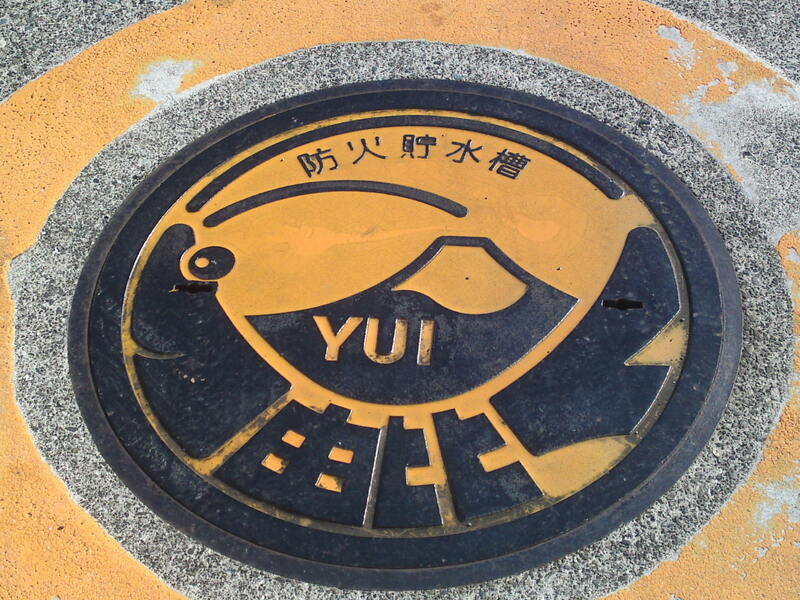 Yaizu City is the most famous Bonito/Katsuo fishing harbor city in Japan! 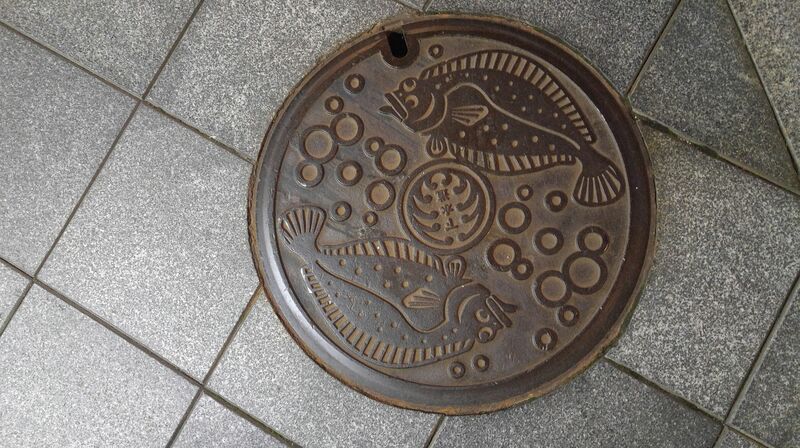 Japan is increasingly becoming known all over the world for its gastronomy and more recently for its unequaled manhole covers. 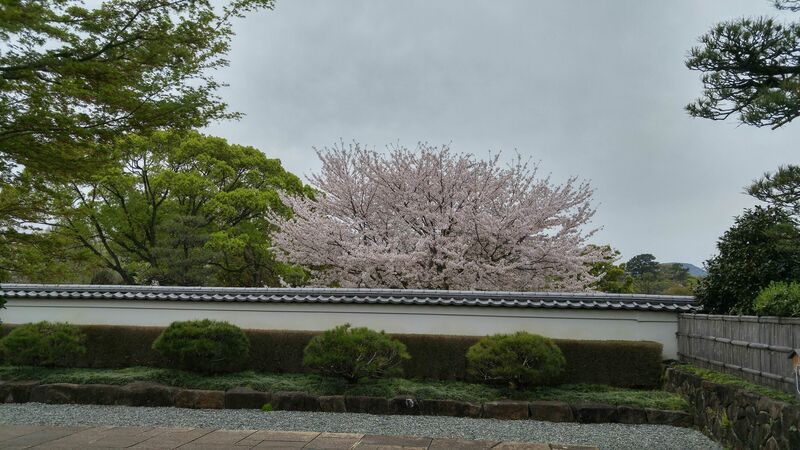 Shizuoka prefecture is no exception when it comes to either, or even better, to a combination of the two! 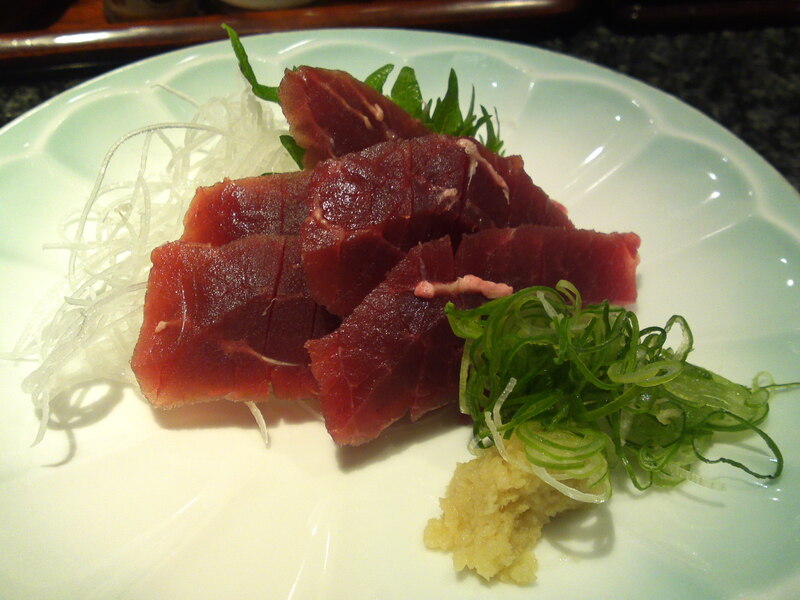 Shizuoka Prefecture has a lot to offer when it comes to gastronomy and is certainly above all when it comes to variety, be it vegetables, fruit or meat when it comes to land and a bounty of seafood when it comes to sea! 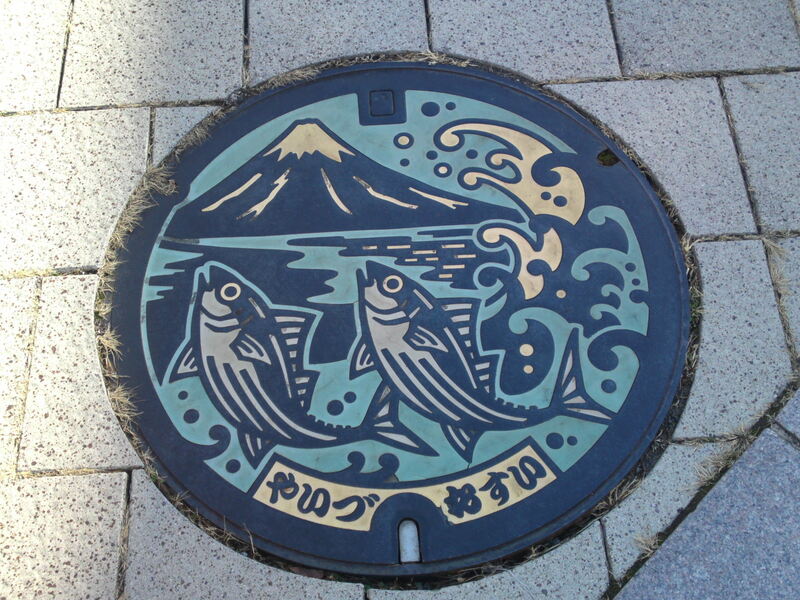 Yaizu City has no less than three different manhole covers depicting Katsuo/Bonito for the simple reason it is the most important fishing harbor in Japan as far as bonito is concerned! 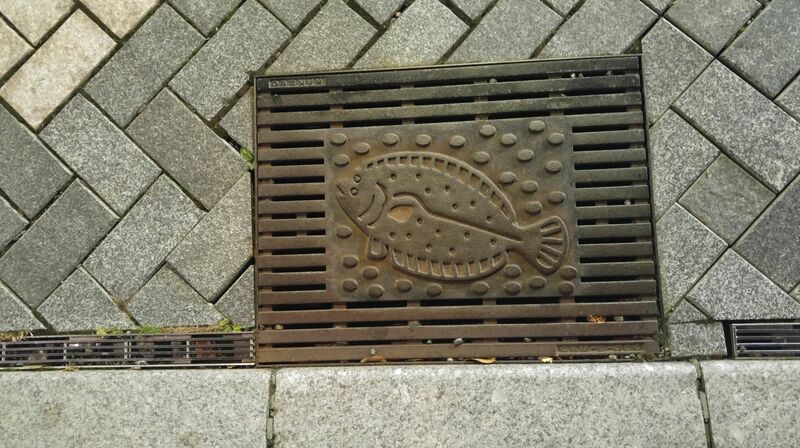 Hirame/Soles or Flounders in Hamamatsu City! 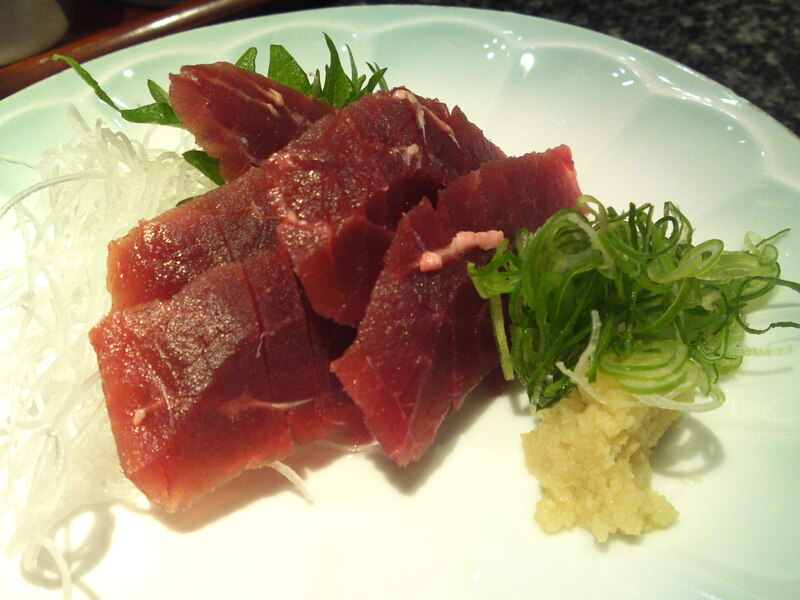 But when it comes to seafood, Yaizu City is only a portion of it all! 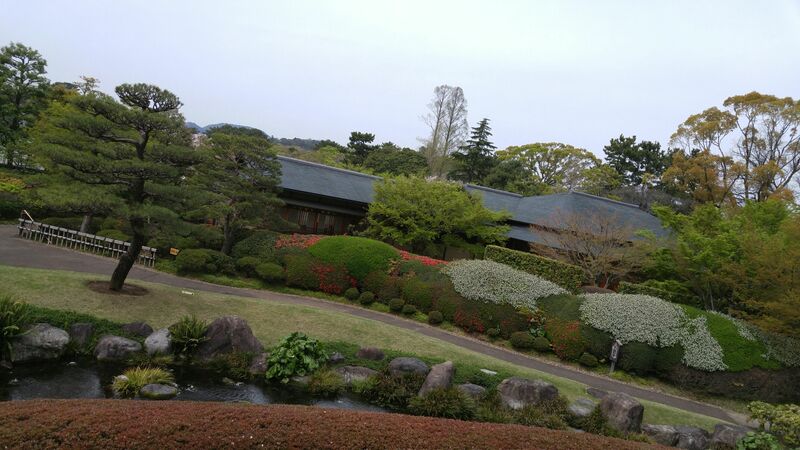 Come to Hamamatsu City for example. 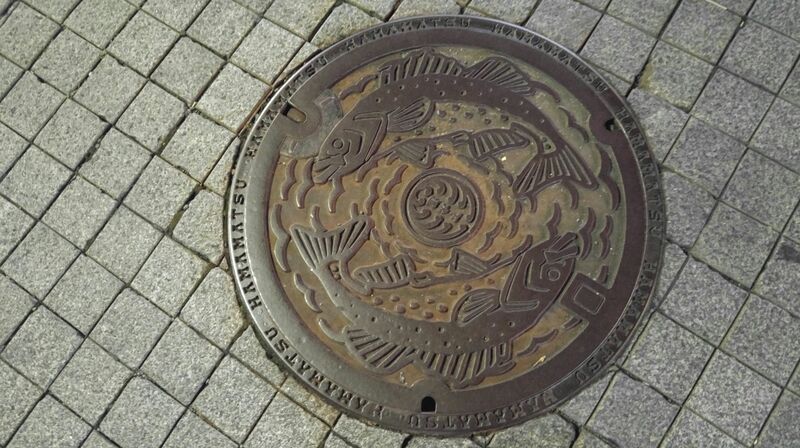 They managed to make a pun out of their own manhole covers! 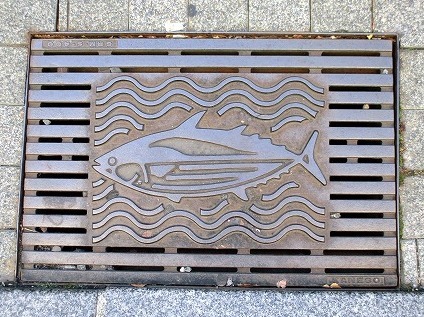 In Sakana, an area in downtown Hamamatsu City they have no less than four covers representing fish because “sakana” written with a different kanji/Japanese character means “fish”! 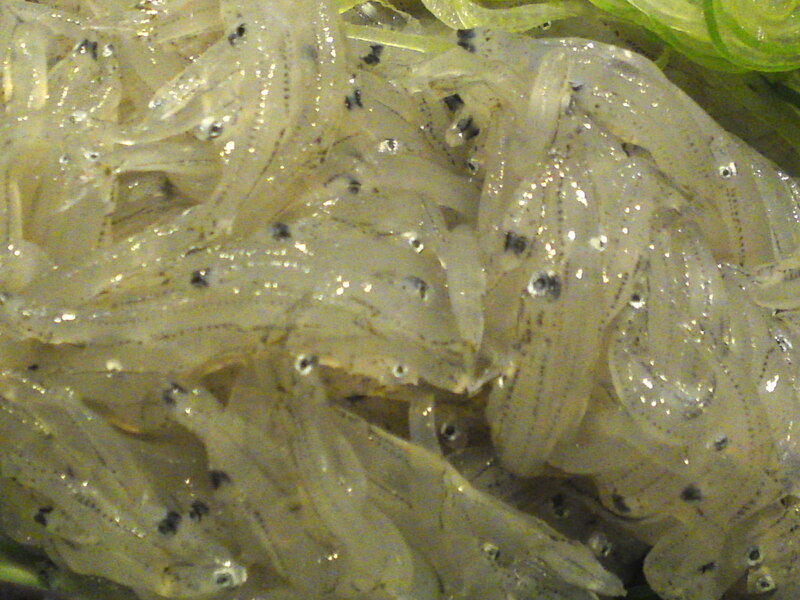 Shall we continue with seafood? 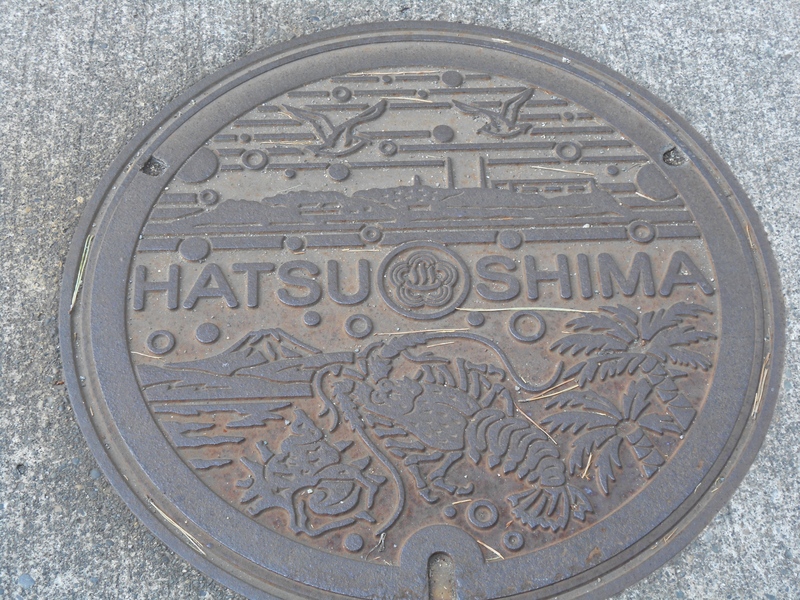 Hatsushima Island is one of the few islands administered by Shizuoka Prefecture. 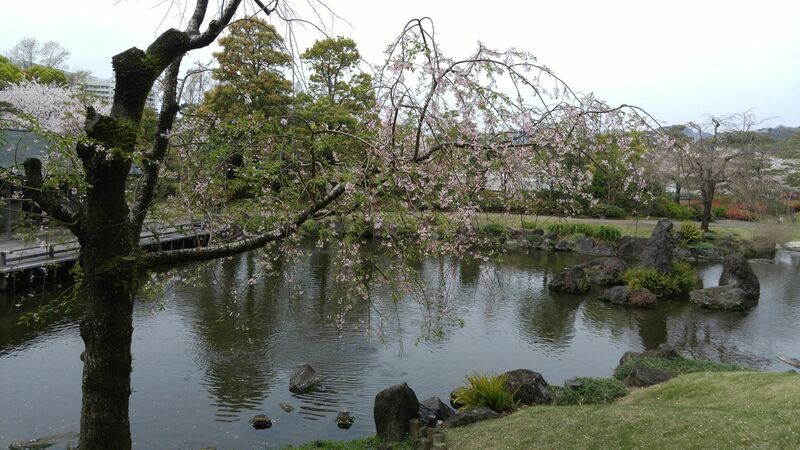 It can be easily reached by ferry boat from Atami City. 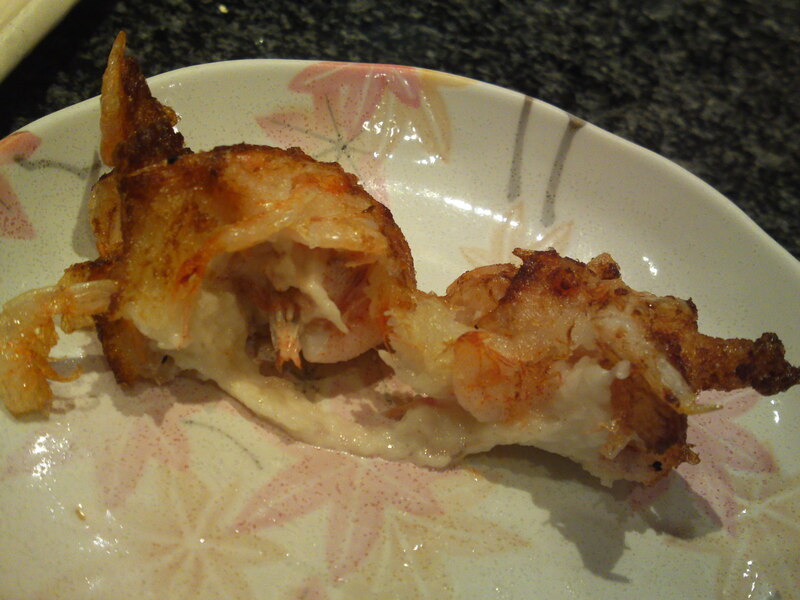 It is celebrated for its “Iseebi”/Spiny lobster and “Sazae”/Turbo shell! 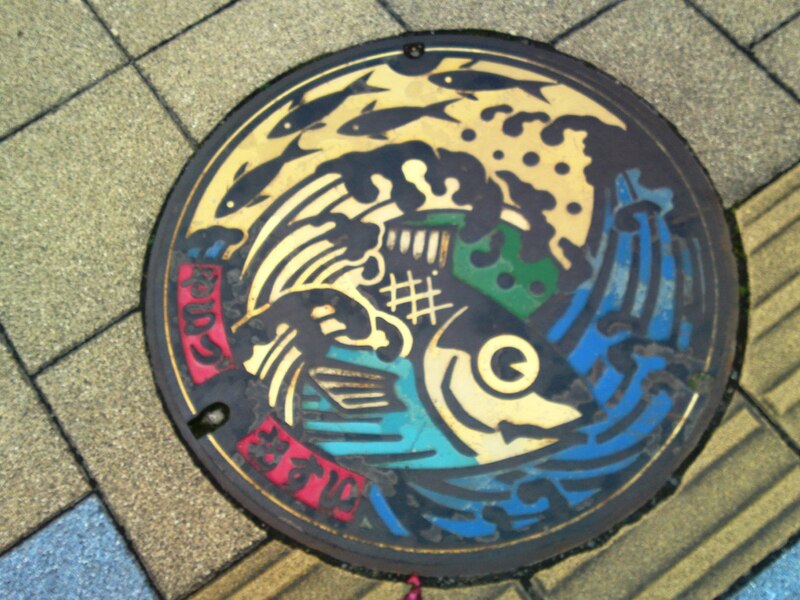 Izu Inatori fishing harbor in south west Izu Peninsula is celebrated all over Japan for its “Kinmedai”/Splendid Alfonsino! 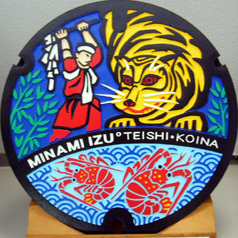 At the very tip of Izu Peninsula Minami Izu is also proud of its “Iseebi”?Spiny lobsters! 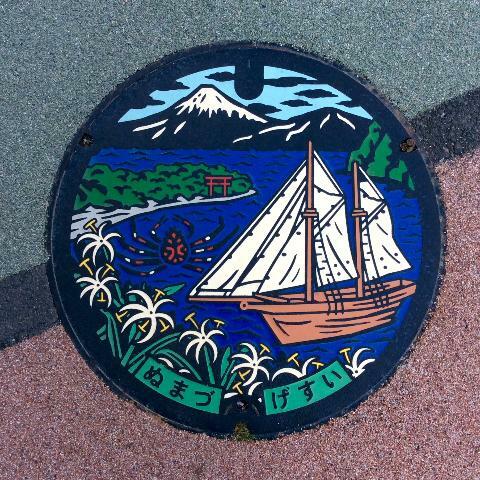 Heda, in North eastern Izu Peninsula, now part of Numazu City, is known for “Takahashigani”/Japanese Giant Crab, the largest crab in the World! 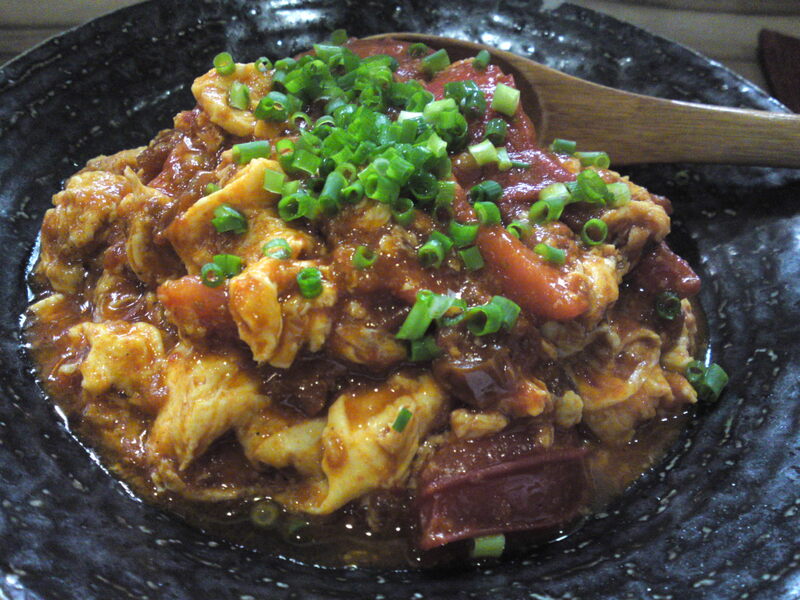 And to conclude with seafoods one must visit Yui, Shimizu Ward, Shizuoka City, known all over japan for its “Sakuarebi”/Cherry Shrimps. Actually there two more tiny covers depicting this little gastronomic treasure! 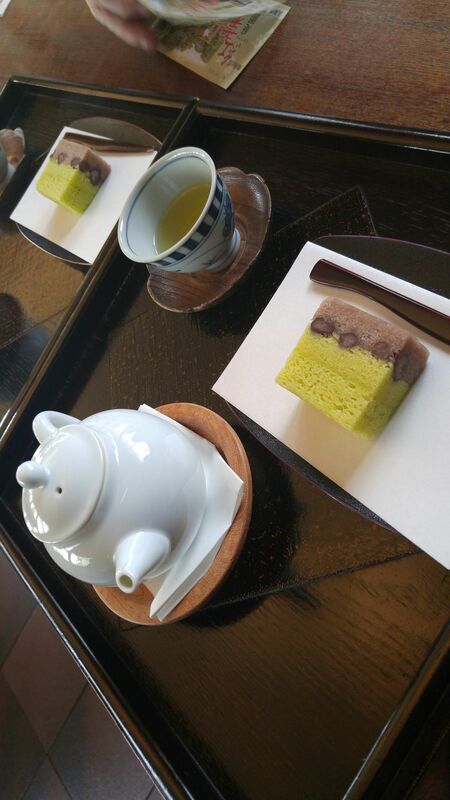 It is about time to switch to land products, and one cannot overlook green tea! 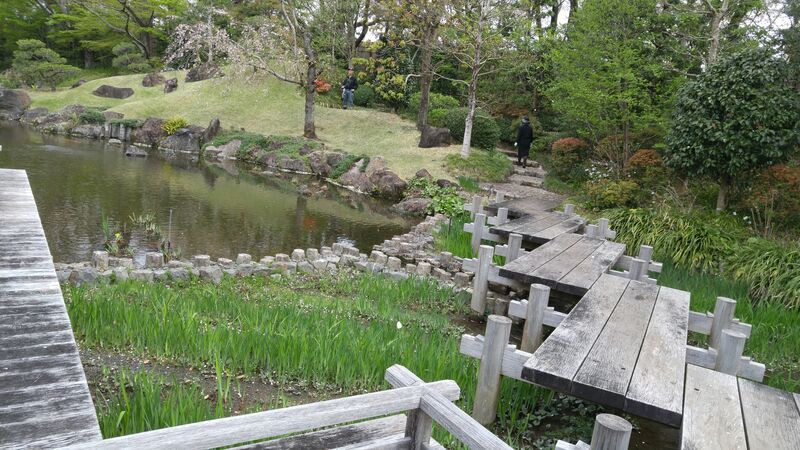 Introduced to Shizuoka Prefecture more than 800 years ago, we are still the biggest producer in Japan. 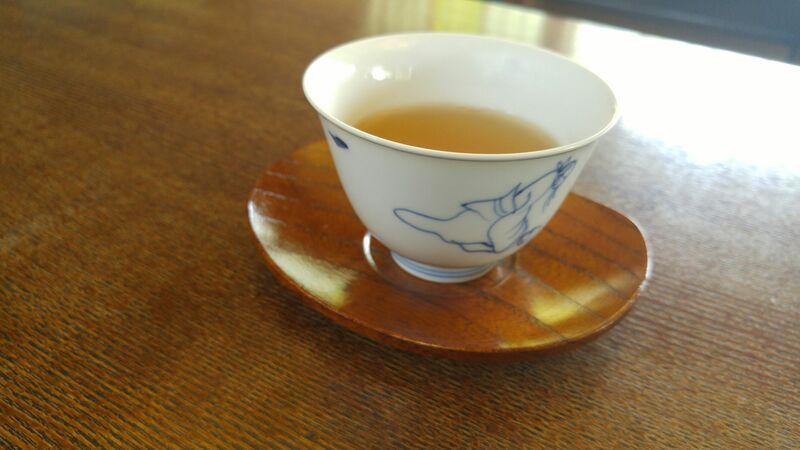 Interestingly enough, covers depicting tea are to be found only (that is, for the present!) 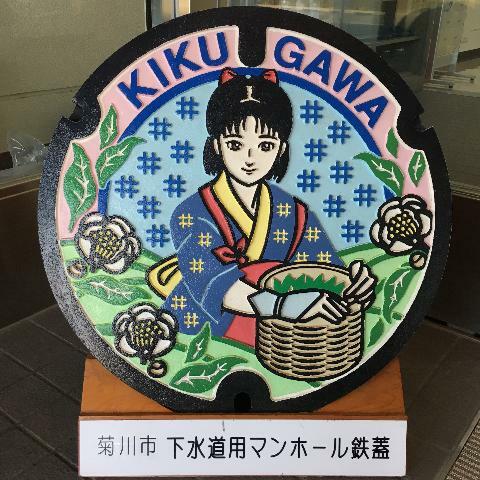 in Kikugawa City with two different types, one of them representing the “Cha Musume”/Tea leaves handpicking girl/lady! 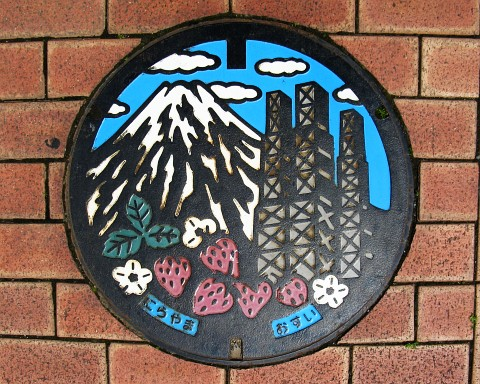 Shizuoka Prefecture is also renown for its strawberries and one can find them on covers in Nirayama, Izu City, also famous for World Heritage Hansharo and its beautiful views of Mount Fuji! 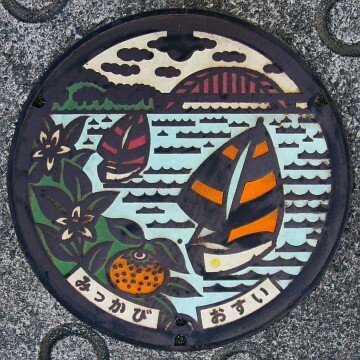 Hamamatsu City is not only famous for its fish, eels in particular, or oysters, but also for its oranges to be found in Mikkabi! 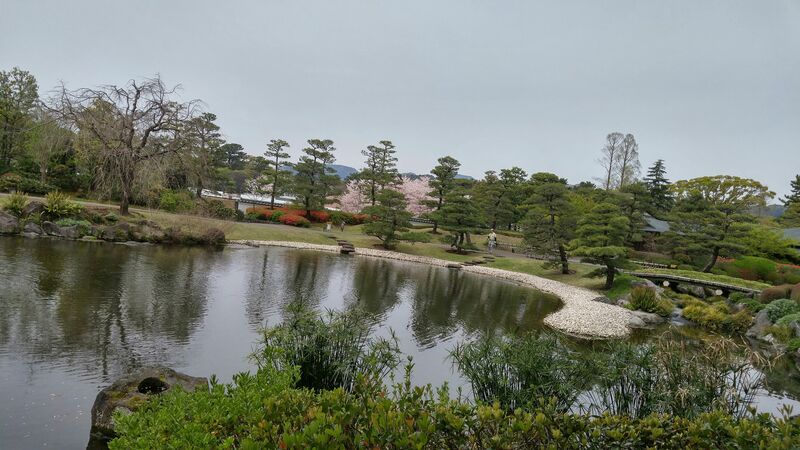 And we can conclude (that is, for the moment, as there must be others to come in the future, what with the booming tourism!) 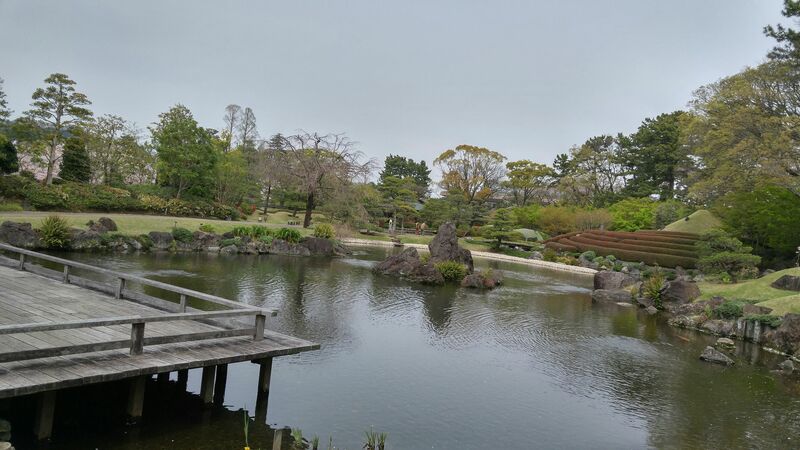 with a lesser known piece of gastronomy: back to the beginning of the 17th Century when Shogun Tokugawa Ieayasu retired to Sumpu (present Shizuoka City) he discovered “nasu”/egg plants exclusively grown in the Orito area (prensently Shimizu Ward, Shizuoka City) and grew so fond of them that he awarded them the appellation of “Orito Nasu”/Orito eggplants. 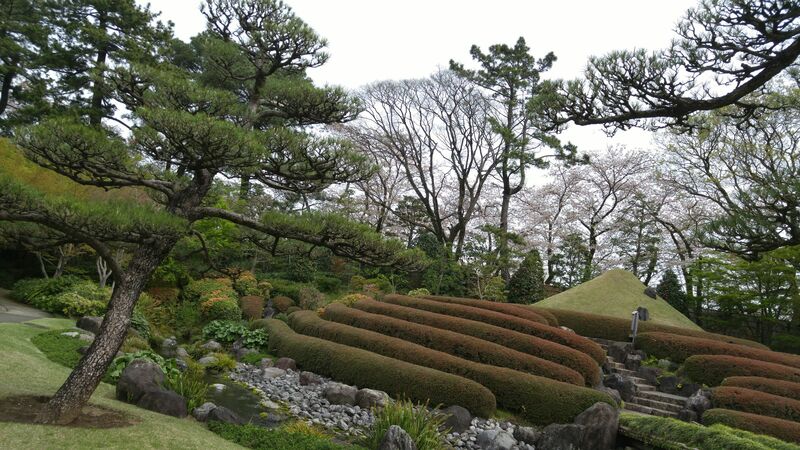 These are still grown there and are a rare vegetable searched by all sorts of renown chefs! 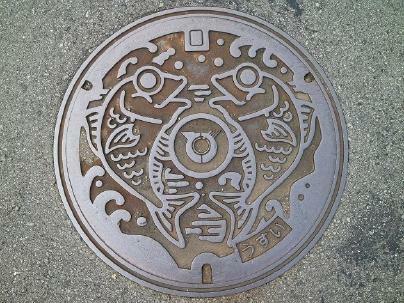 Can you see it at the bottom right of the manhole cover? 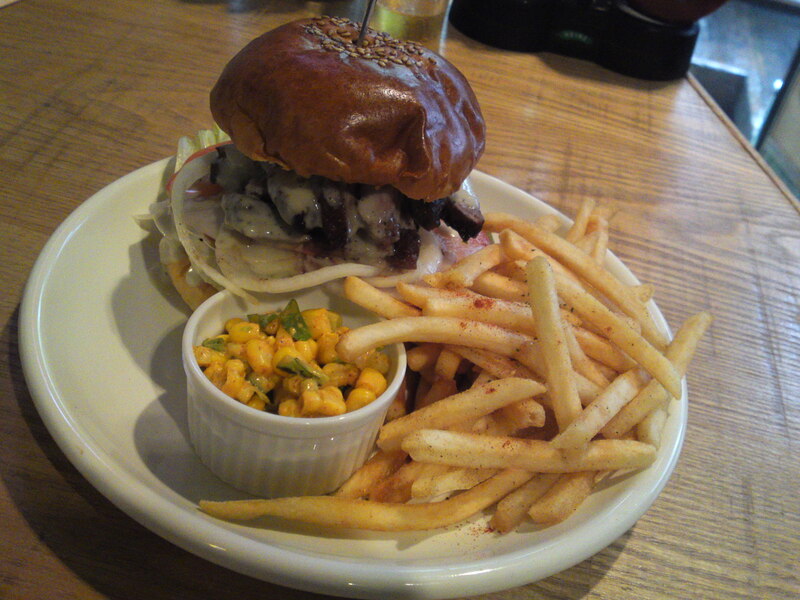 Good search and bon appetit! 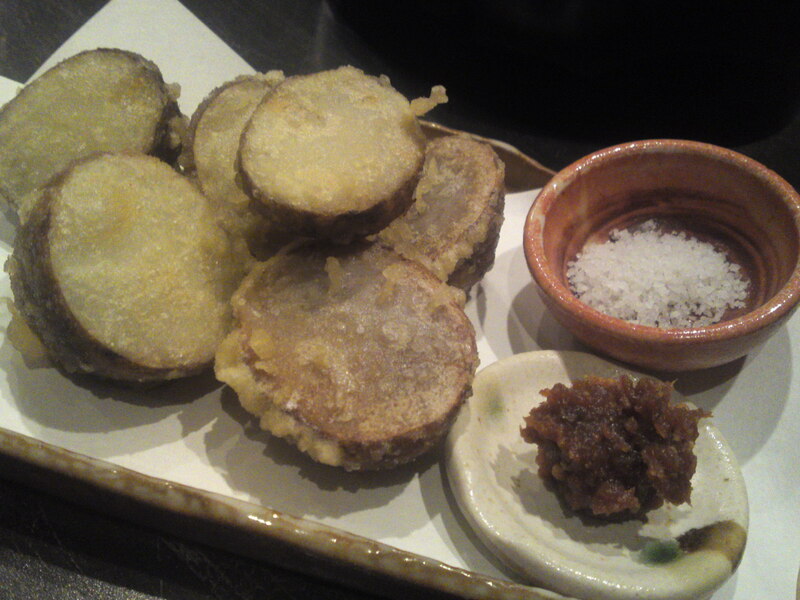 Shizuoka Izakaya (and ranking): Hana Oto in Shizuoka City! 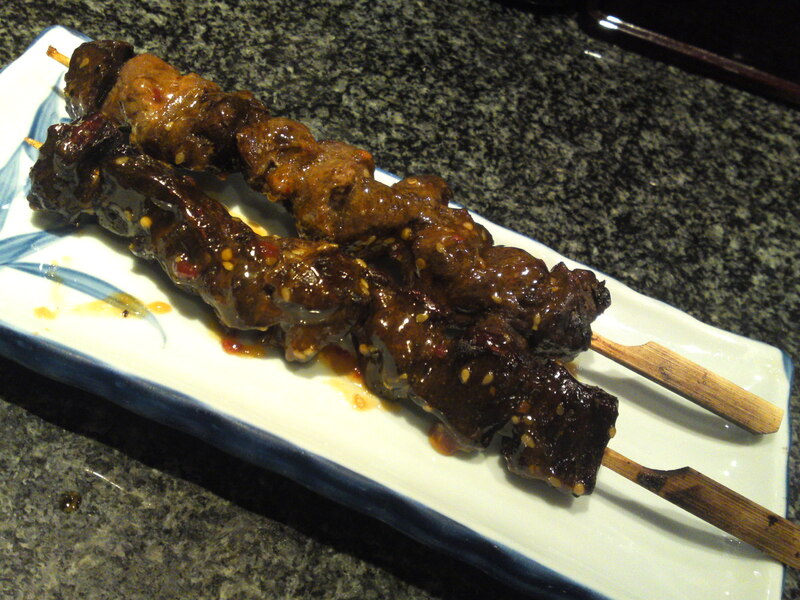 Strong points: Great use of local ingredients in beautiful Izakaya -style Chinese Cuisine. 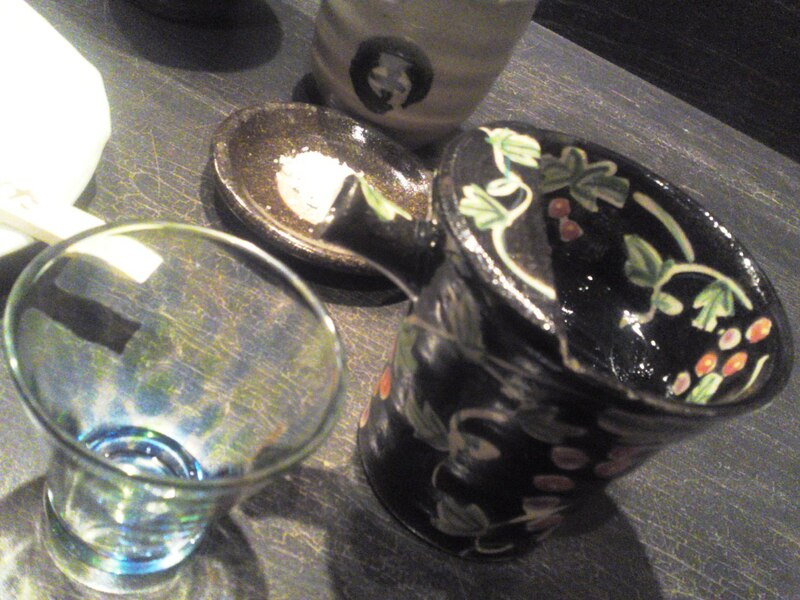 Great sake and shochu! Whatever the nationality or the genre of the gastronomy, a good chef makes an exclusively use of ingredients not only superlative but whenever possible local! 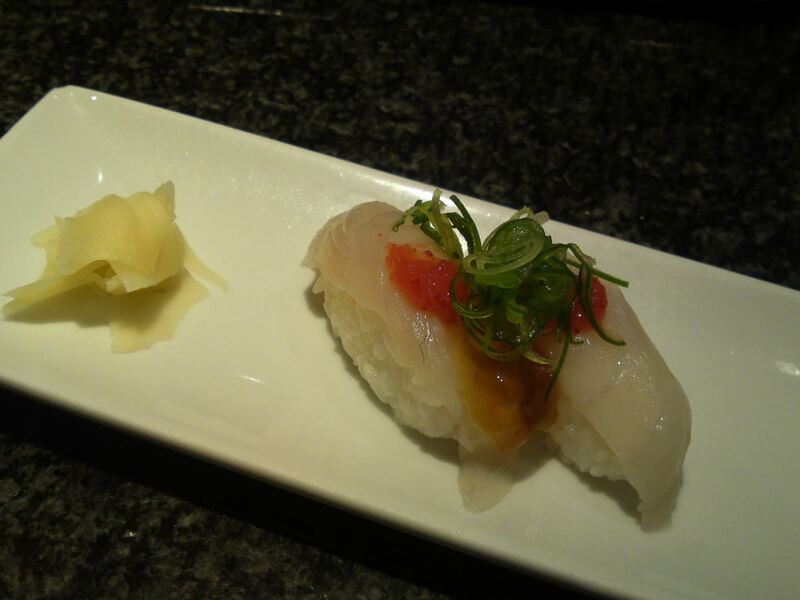 Only then the skills make the difference between a good and a great chef! 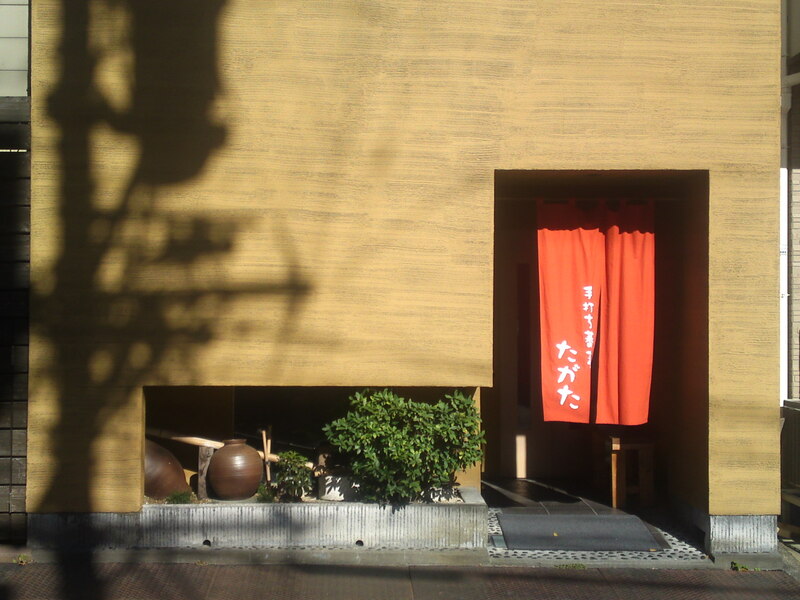 The entrance to Hana Oto/華音 is simple and unassuming, always a good sign! 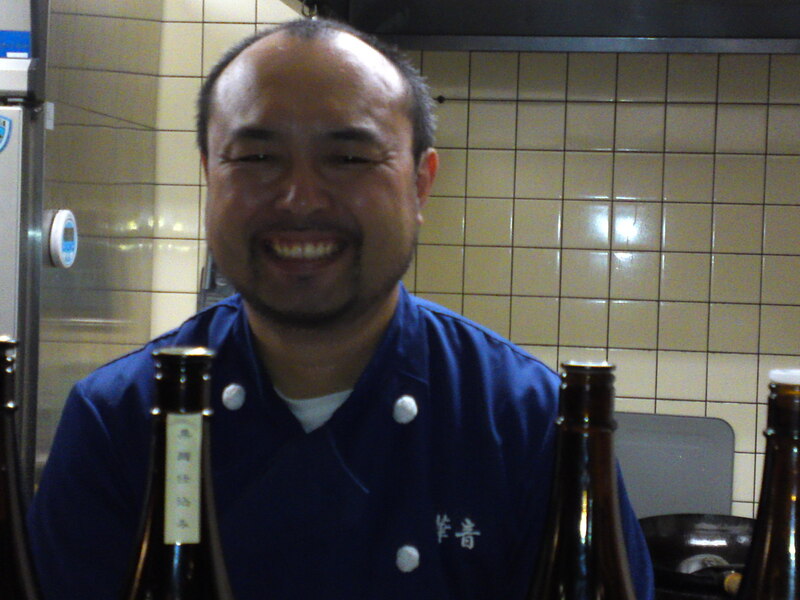 Chef Yuusuke Toozaki/登崎雄介decided to move to the present location a few years ago to be able to welcome all his guests in a larger establishment! 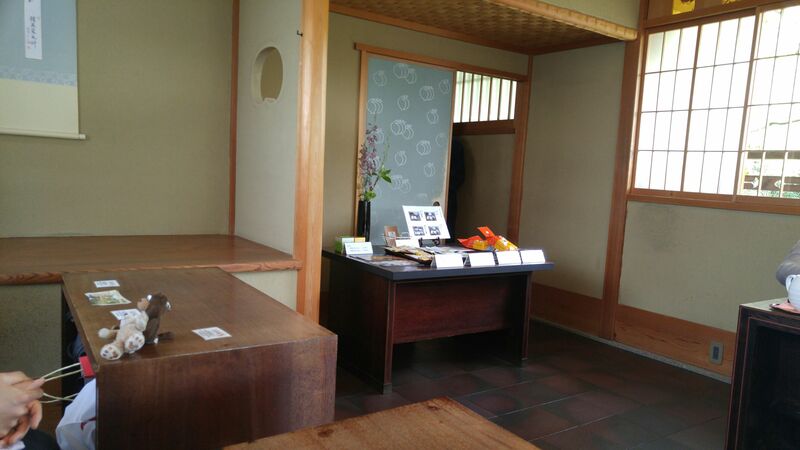 It is always a good idea to reserve a seat either at the counter or on the tatami floor! First of all he caters for all tastes as far as drinks come! 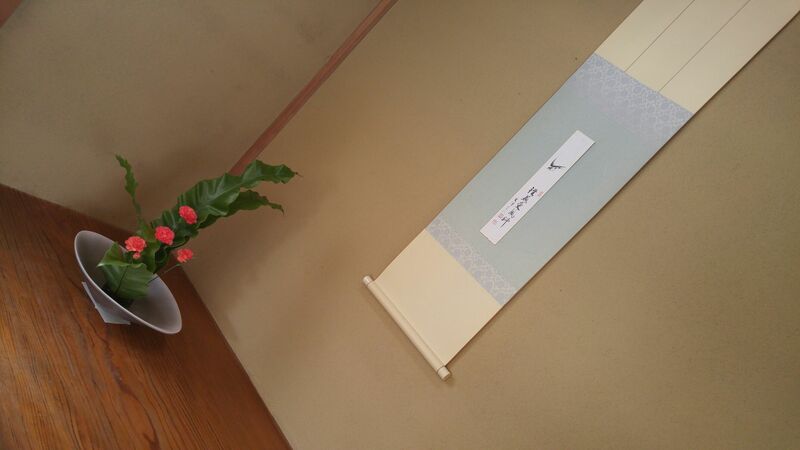 You may as well as consult him before choosing a shochu if that is what you want! 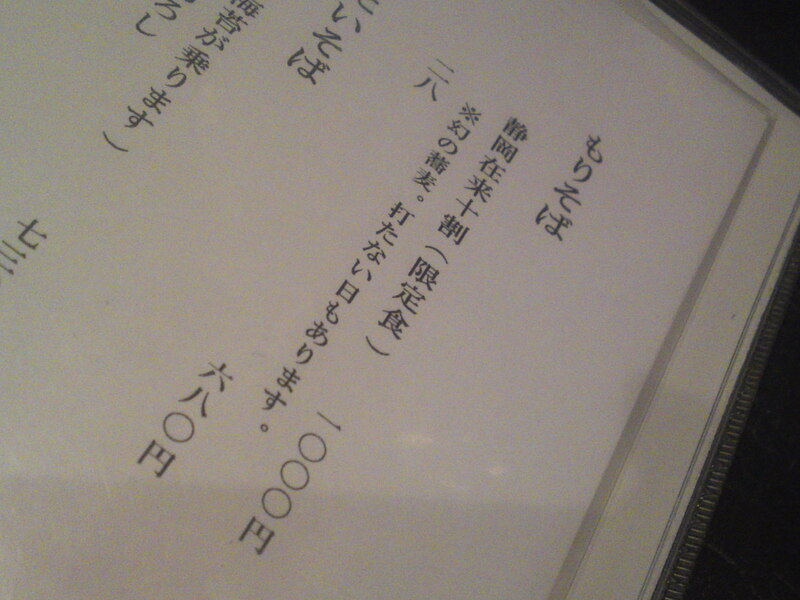 Of course beer and wine are available! 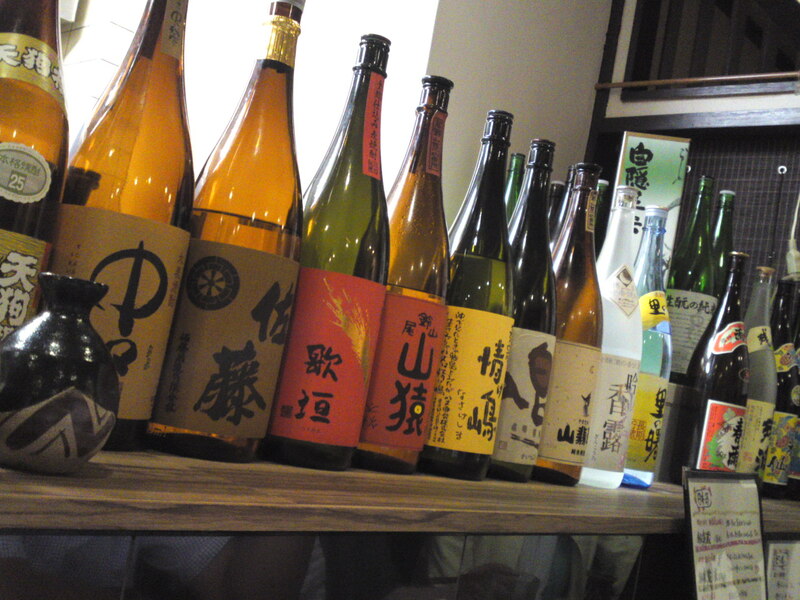 As for the Japanese sake, there is plenty to choose from, too! 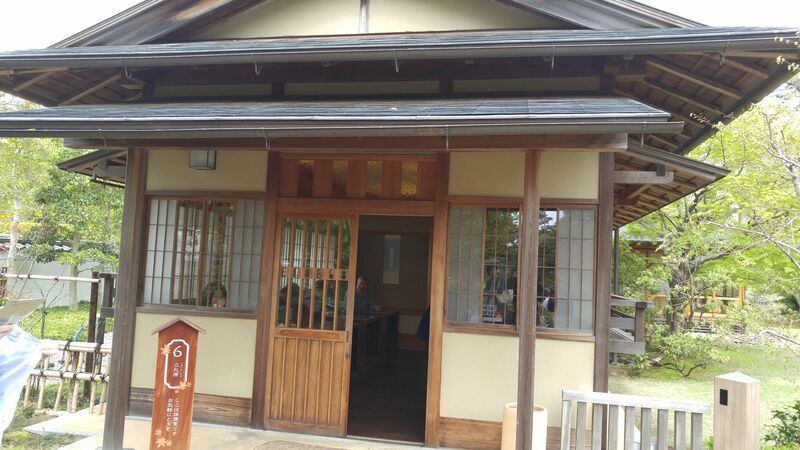 At least three great sake from Shizuoka Prefecture are catered! 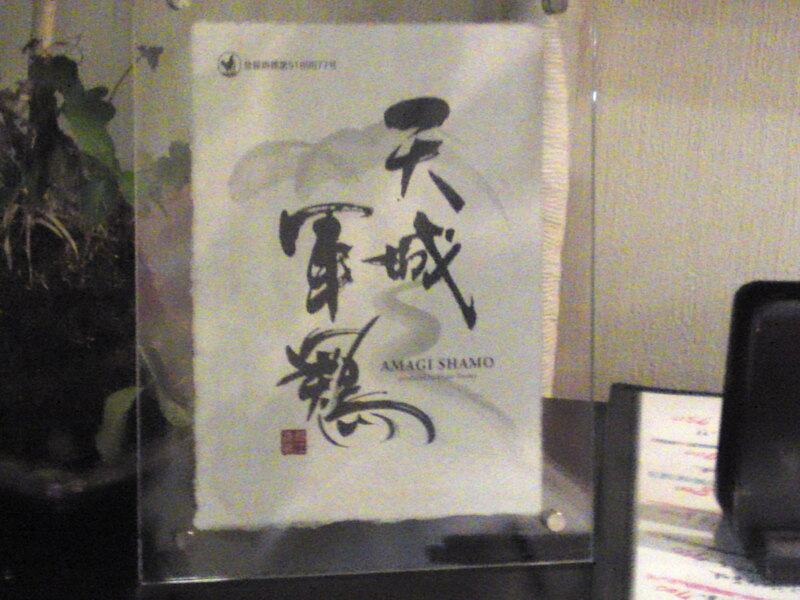 Now Hana Oto is one of the rare restaurants serving Amagi Shamo, arguably the best chicken in the Prefecture and probably Japan! 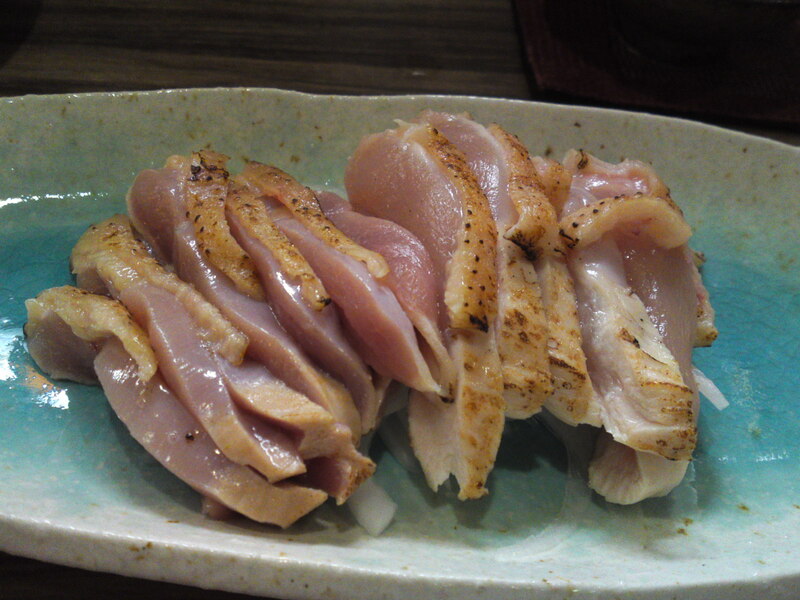 This chicken is, among others, fed with wasabi leaves and soy milk from Izu Peninsula! 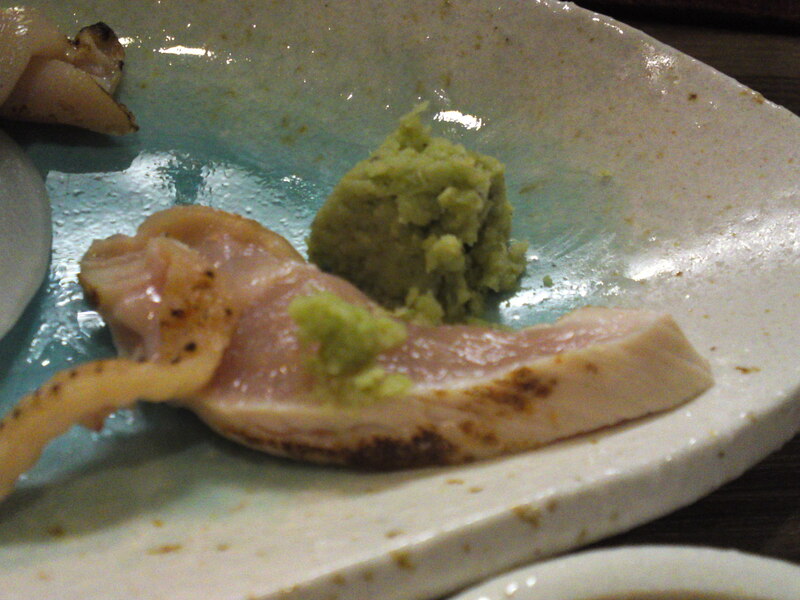 Served with freshly grated Shizuoka wasabi (and maybe a little soy sauce), a rare delicacy! 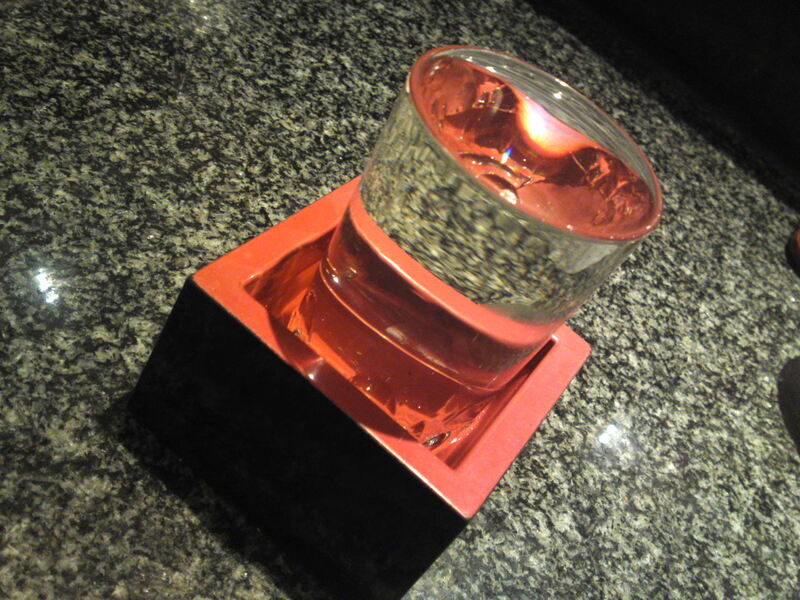 On that night I had beautiful sake brewed by Eikun (Yui) and Sugii (Fujieda) breweries! 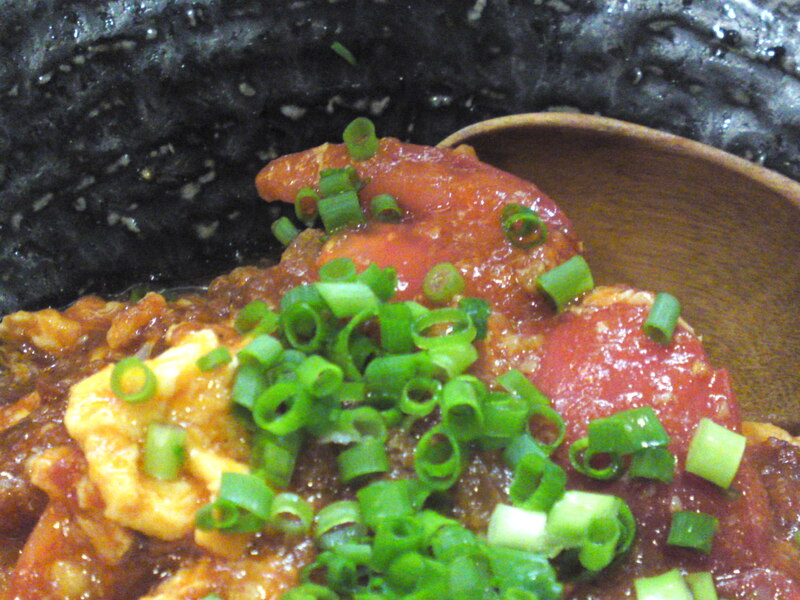 Jukusei Tomato to Tamago Pirikara Itame/熟成とまとト卵ピリ辛炒め/Stir-fried hot ripe tomatoes and eggs! 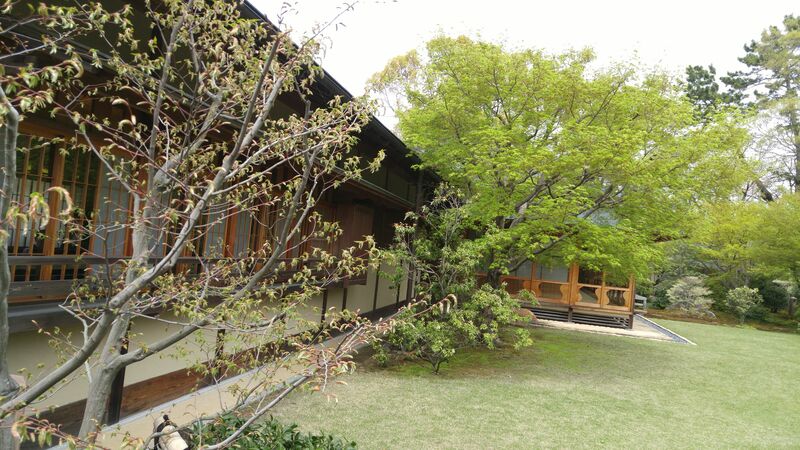 Toozaki San makes an extensive use of the best quality vegetables of the Prefecture! 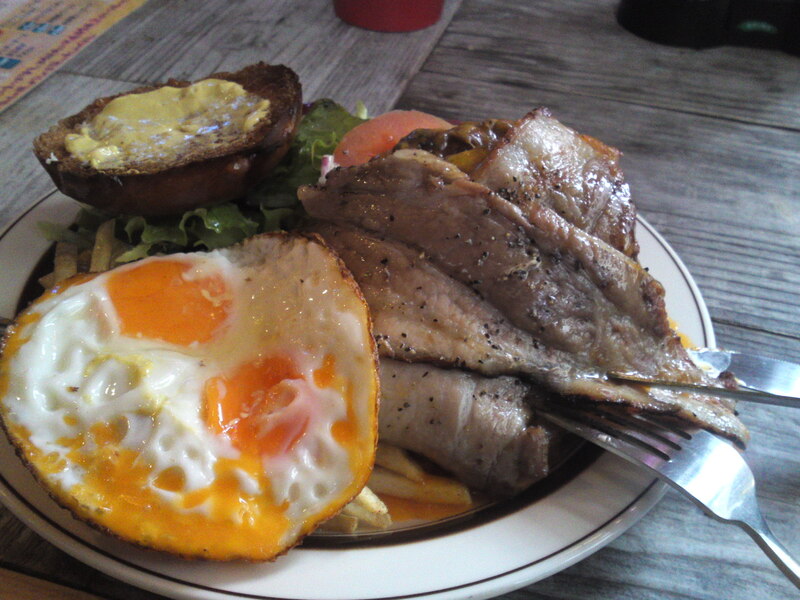 These ripe tomatoes were grown at Suzuki Tomato Garden in Shizuoka City! 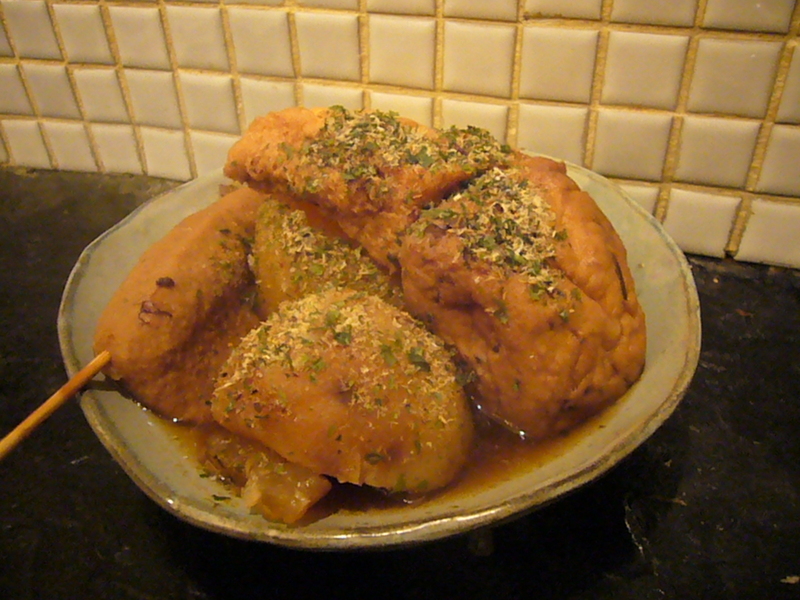 A fulfilling and healthy dish with a great balance! 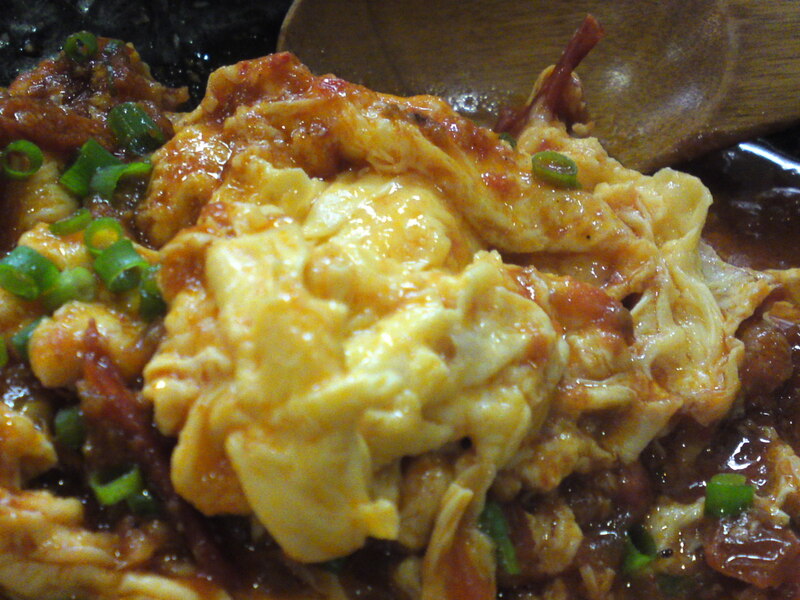 Unctuous eggs fried to perfection! 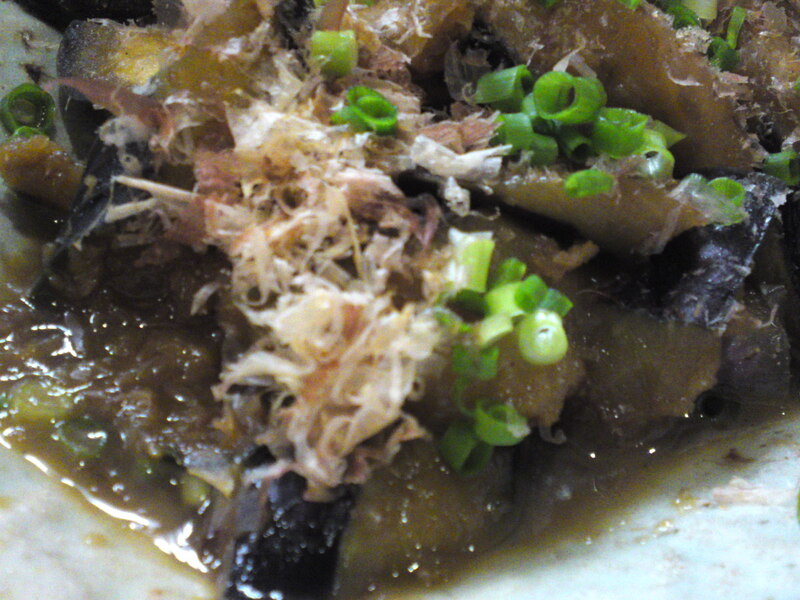 Nasu no Shyouga Shoyu Itame/茄子の生姜醤油炒め/Stir-ried eggplants in ginger and soy sauce! 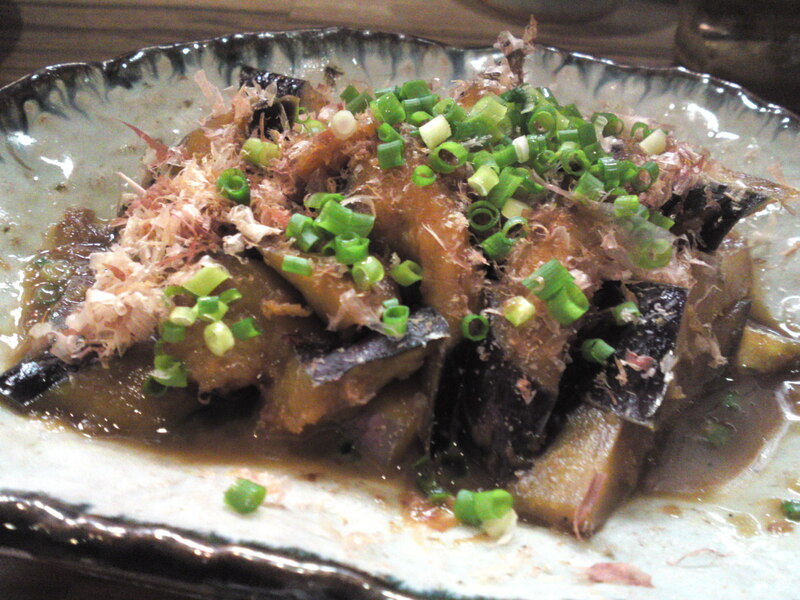 These eggplants were grown organically in a family garden in Shimizu Ku, Shizuoka City, proving a great search for the best ingredients! 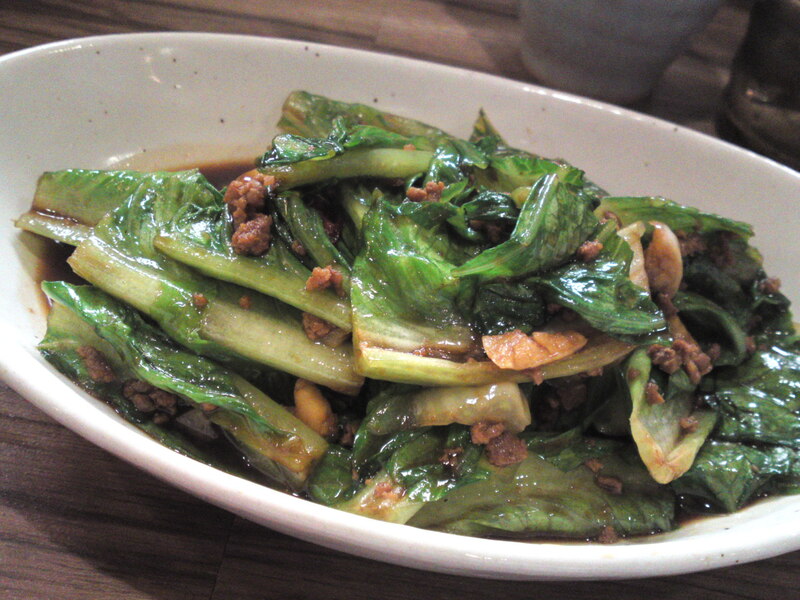 Matsuki Farm Romeenu Retasu to Hikiniku no Pirikara Itame/松木ファームロメーンレタストひき肉のピリ辛炒め/Hot stir-fried Matsuki Farm Romaine Lettuce and minced meat! 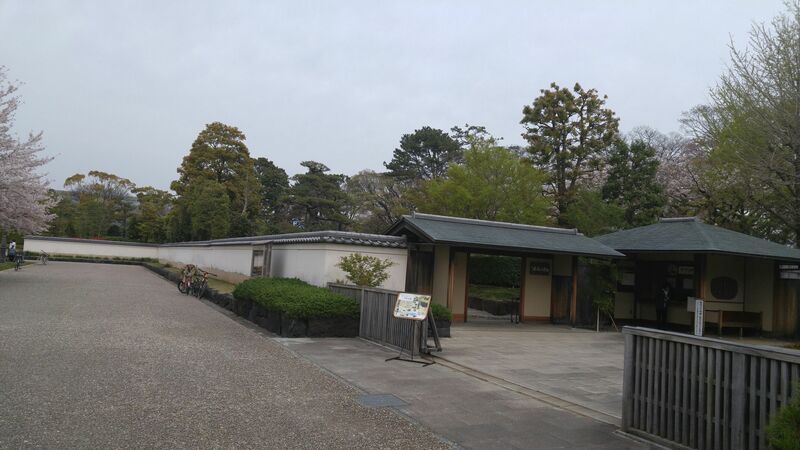 The Romaine lettuce was organically grown at Matsuki Farm in Fujinomiya City! 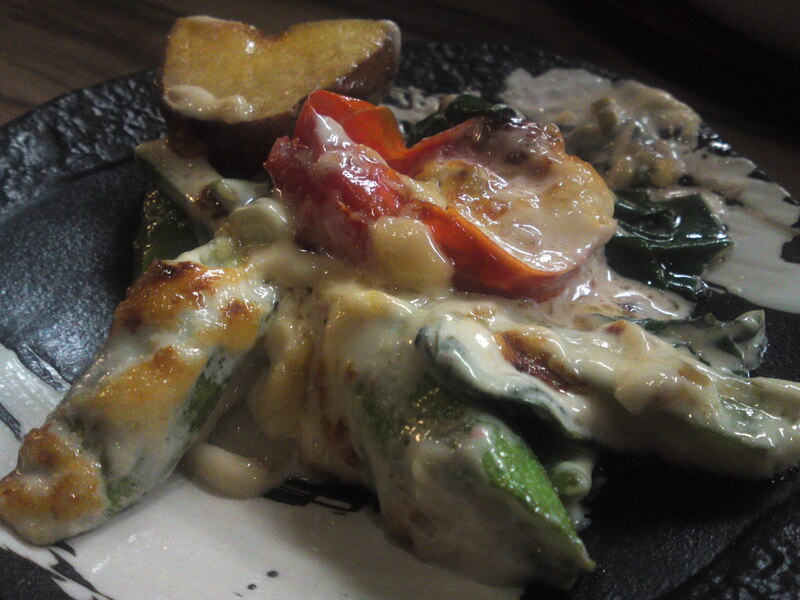 Misonaise Vegetable Gratin at Hana Oto! 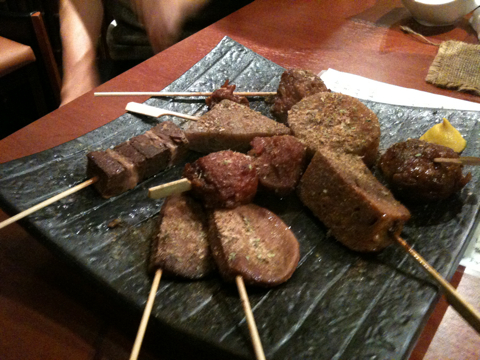 Yuusuke Tozaki’s concept will appeal to all nationalities, especially in colder weather as it is hot and nourishing! 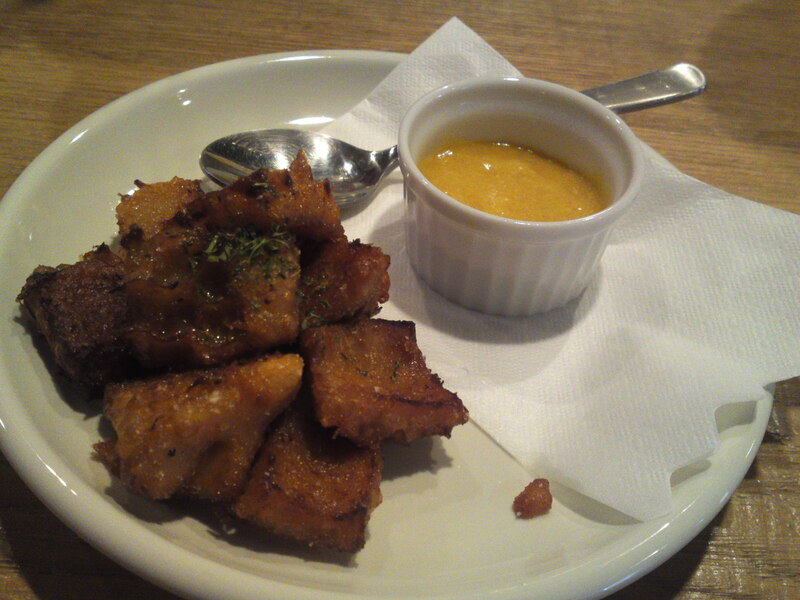 A mixture of miso paste and mayonnaise! 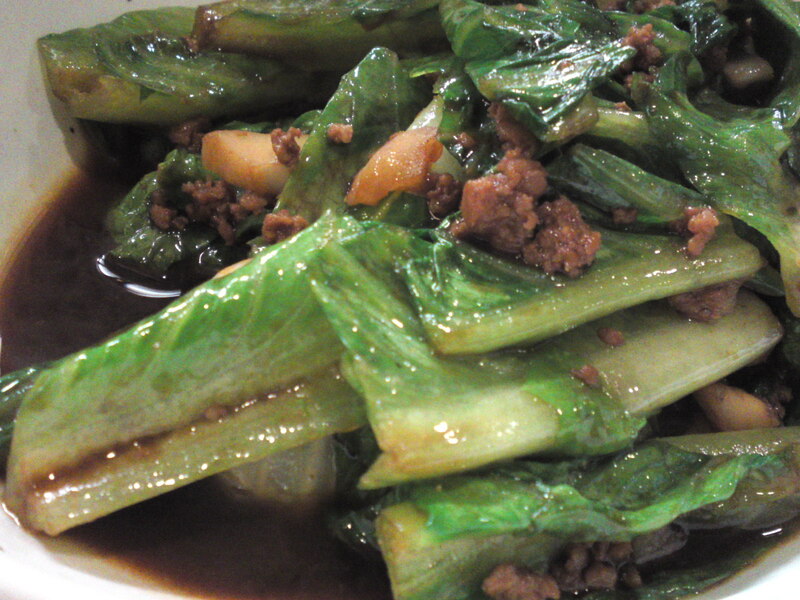 Some of the vegetables are first fried while others are steamed, boiled or raw. 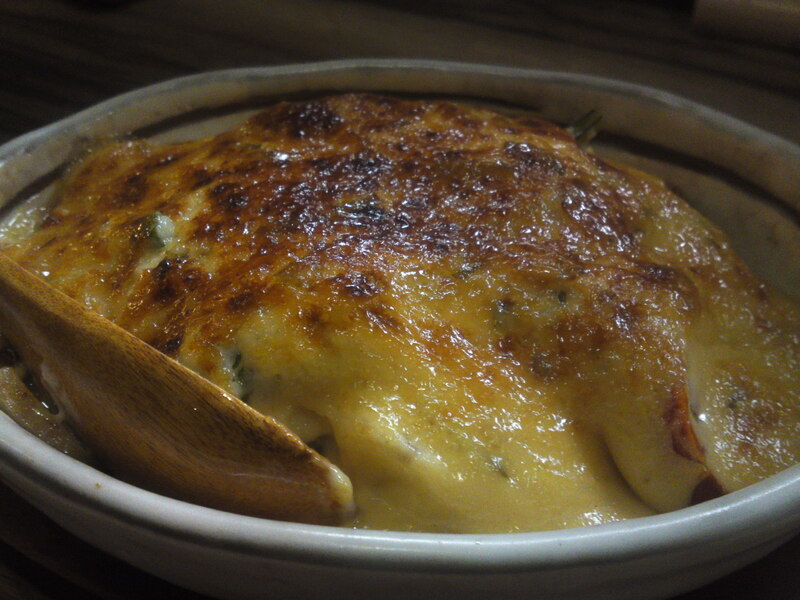 The sauce, including enough condiments to season the whole, covers a generous portion of those vegetables before being cooked as a gratin in an oven! 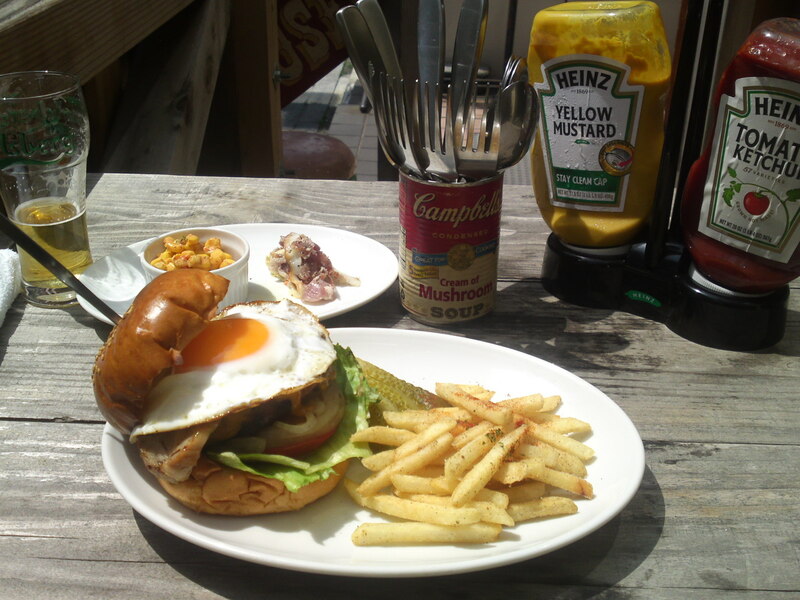 Try it at home! It’s worth it! Well, you can be assured this is only the start of a long relationship considering the untried dishes and the changes with seasons! 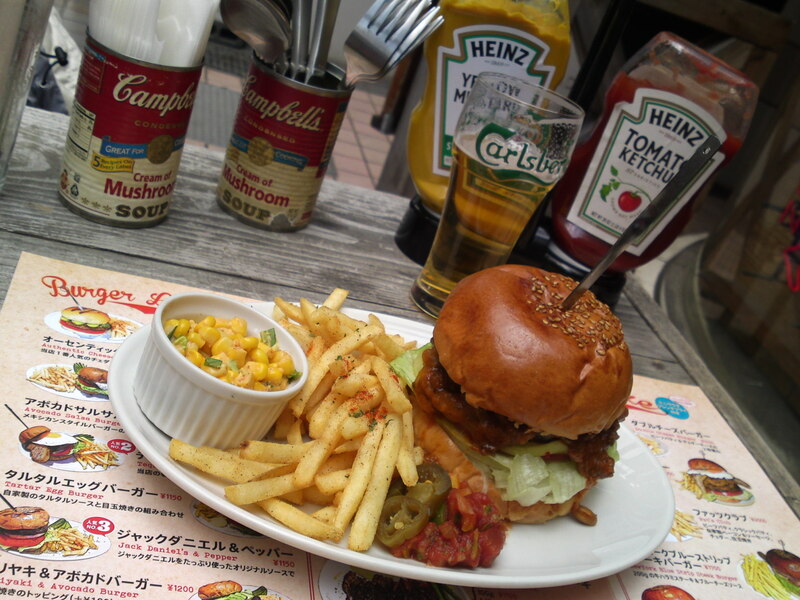 Superb Japanese Hamburgers at Tequila’s Diner in Shizuoka City! 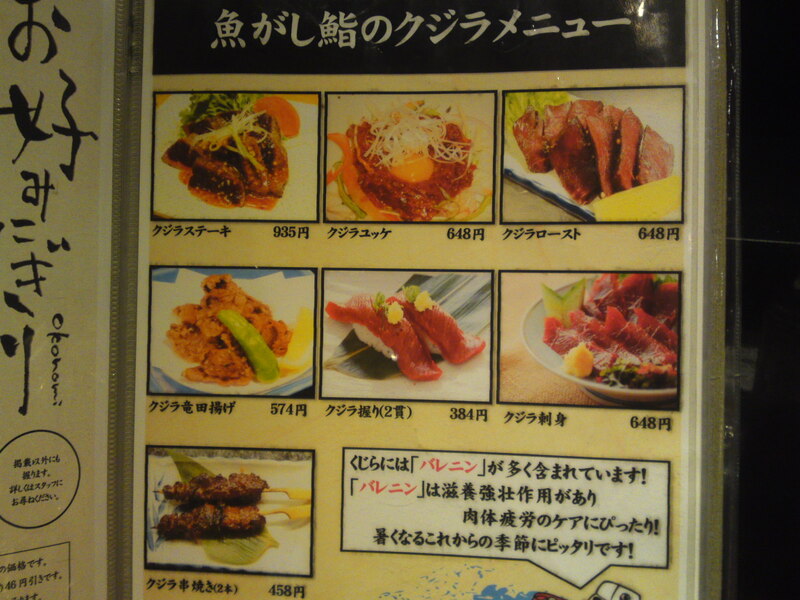 If you are a visitor or resident, and true meat lover, and want to take a break with all the beautiful sushi and other superlative Japanese gastronomy in Shizuoka Prefecture, the place to visit day and night is Tequila’s Diner in Aoi Ku, Shizuoka City, next to Aoba Park Street! 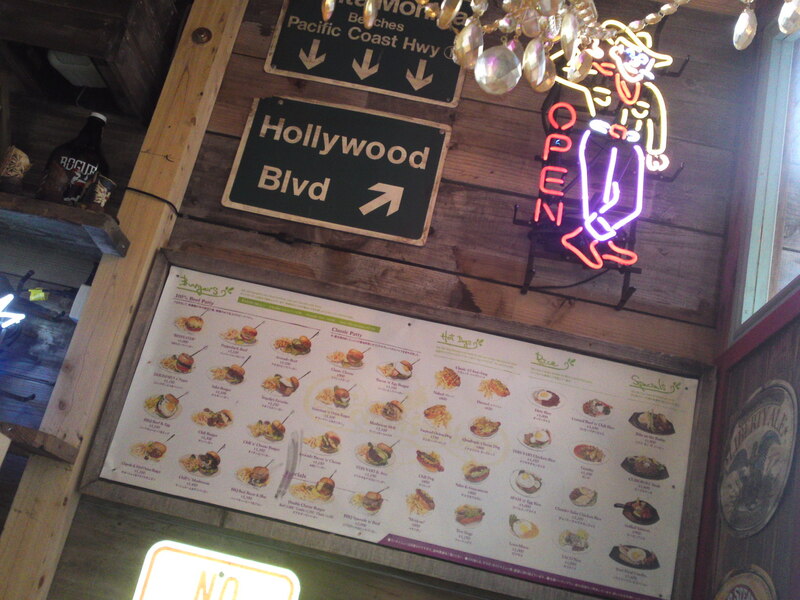 The regular menu and extras will take you some time to read through and even more to choose from! 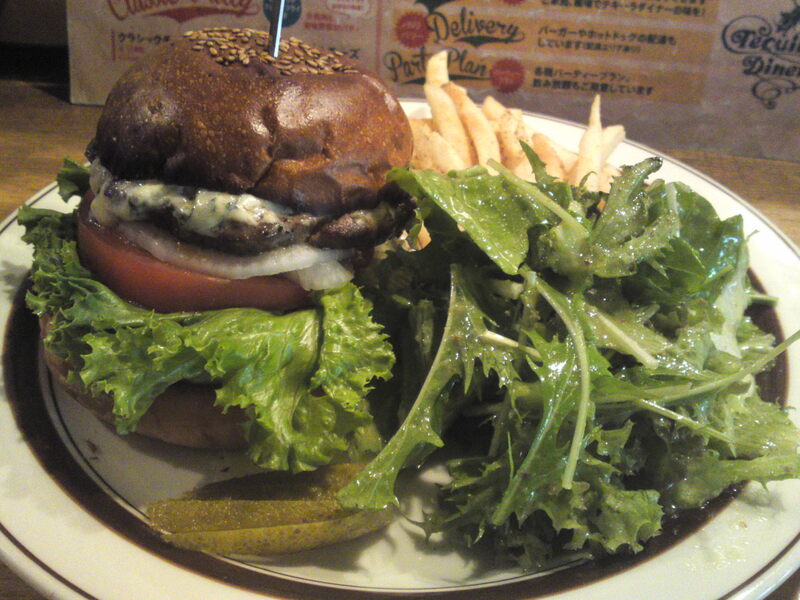 First of all, and probably most important, Chef Chihiro Okamoto’s patties are made with hand-chopped meat of first quality which might explain the somewhat high prices, but they are far helthier and tasty that some found in notorious diners! 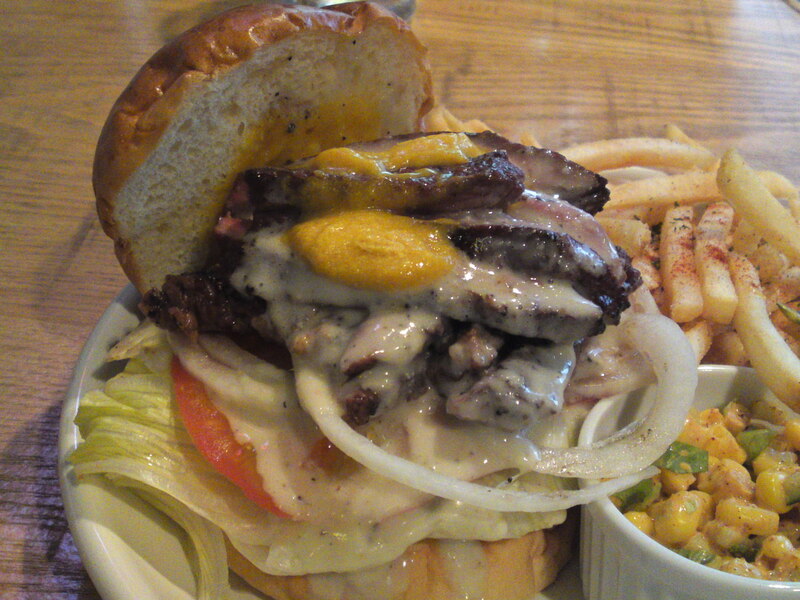 Moreover, all vegetables are local and the buns baked by local bakers! 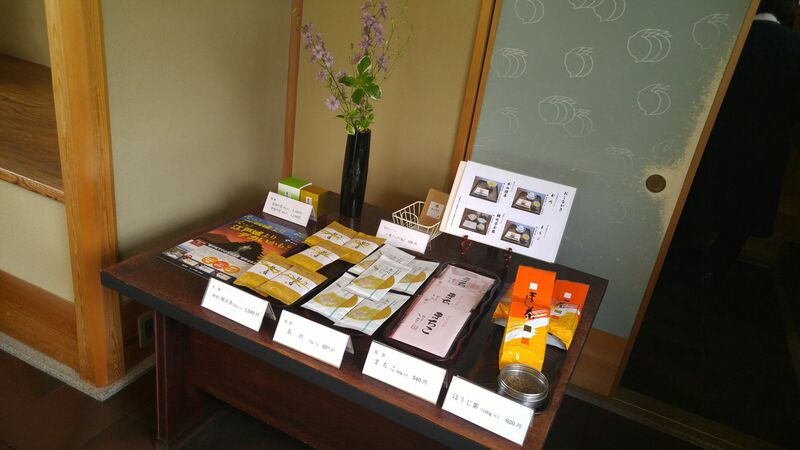 Chihiro goes as far as reducing salt for his kid customers! 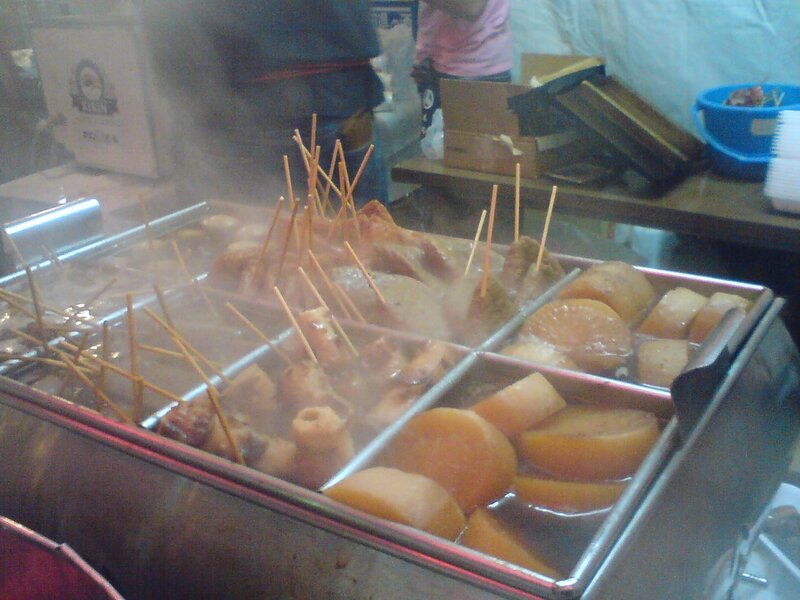 To make a very long story short, let me introduce the yummy morsels I have personally savored and convince you to visit the place! 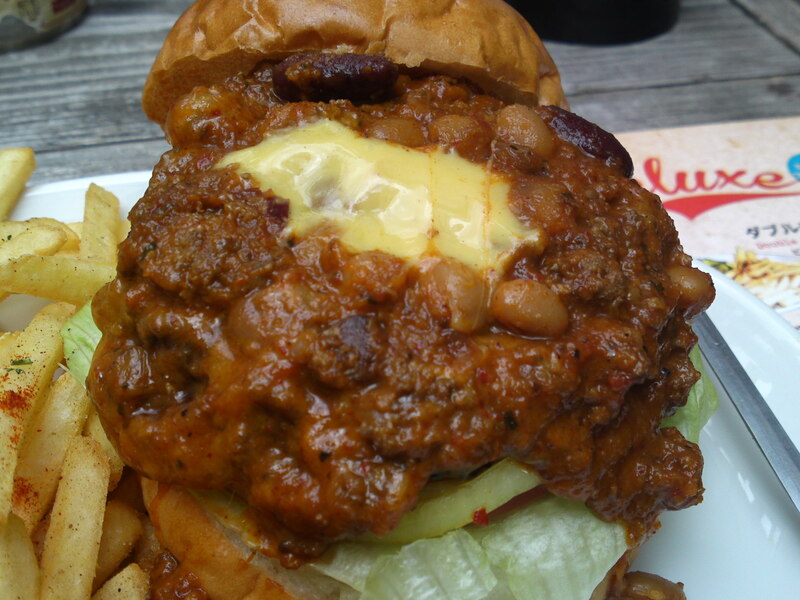 A little folly: Crazy Double Decker! 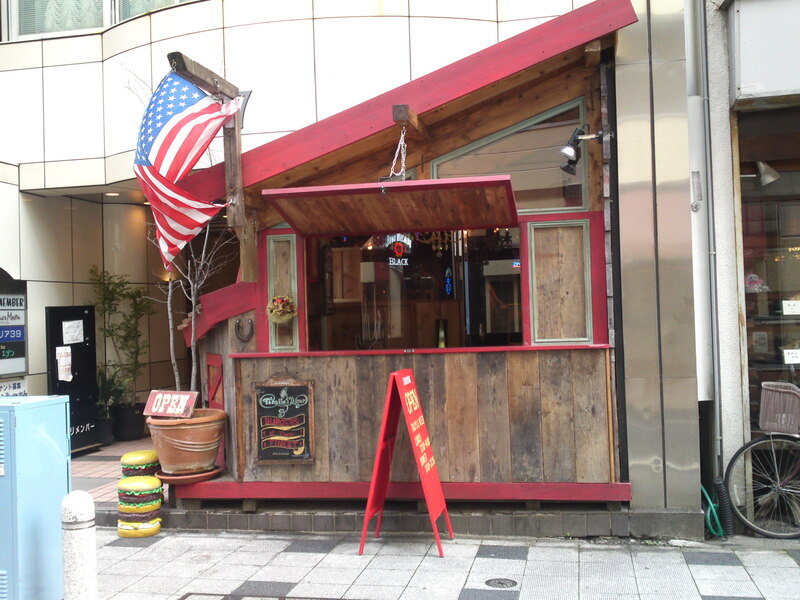 I know a lot of American and Canadian friends who would come just to sample those beautiful chili (not really hot, thanks!) beans! 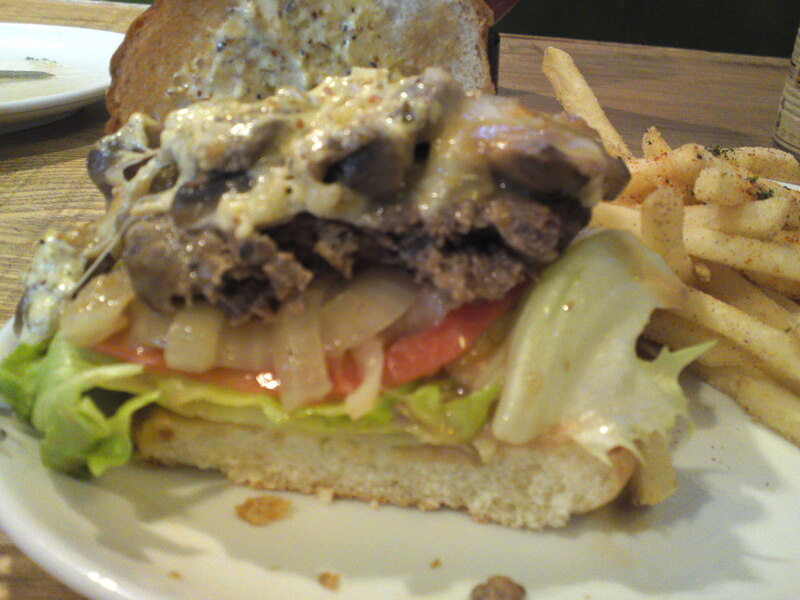 New York Blue Strip Burger! 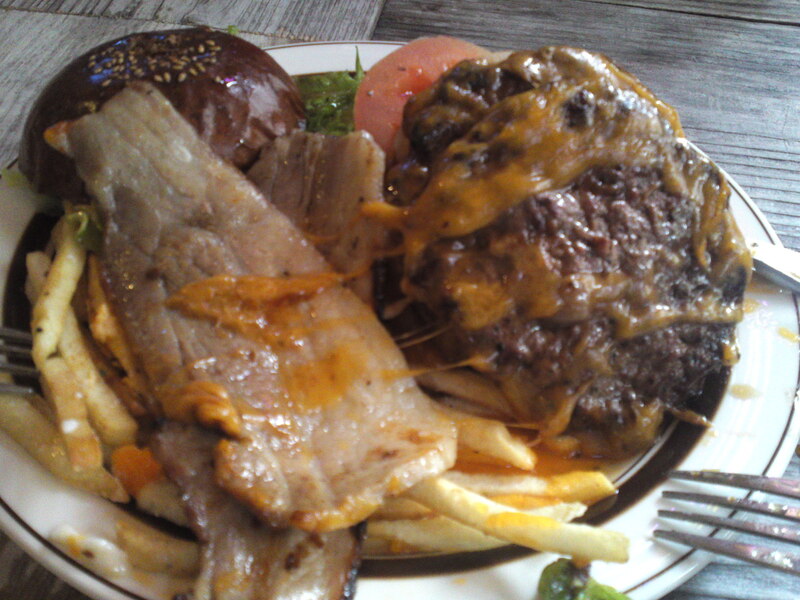 “Raising the cap” you will discover a whole steak, grilled semi-rare, cut in strips. And plenty of it! 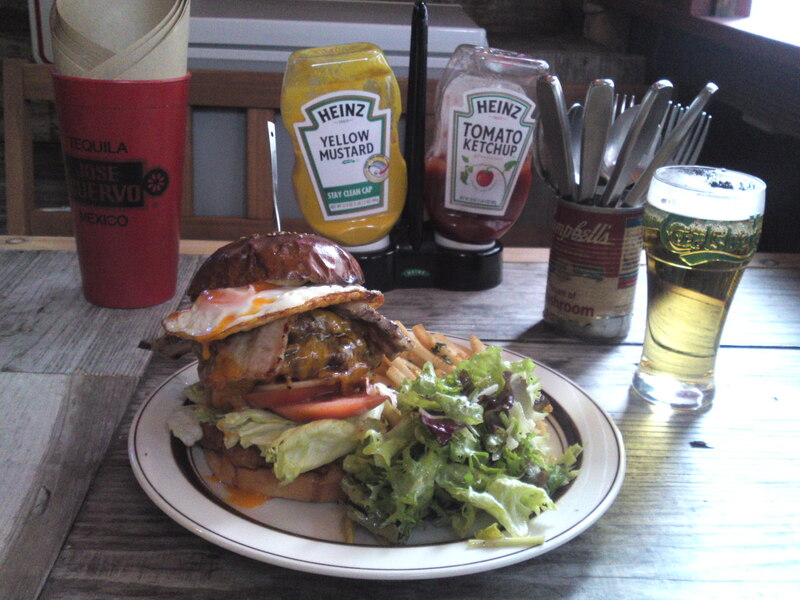 Better eaten with fork and knife! 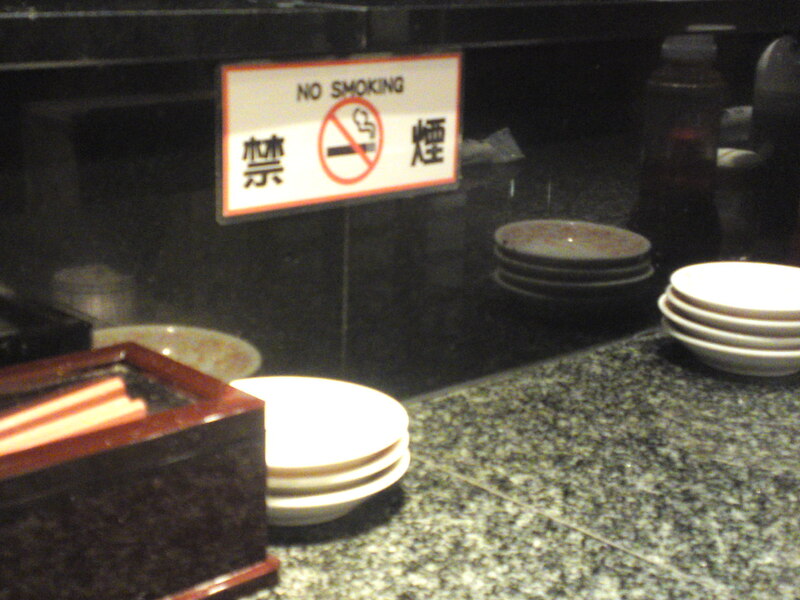 Once again you will better off using a fork and knife! 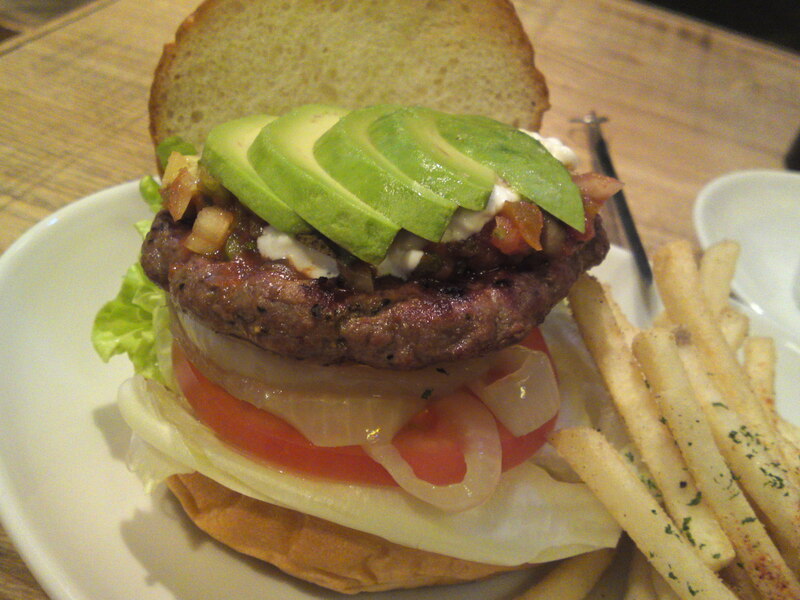 The Avocado n’ Salsa Hamburger! 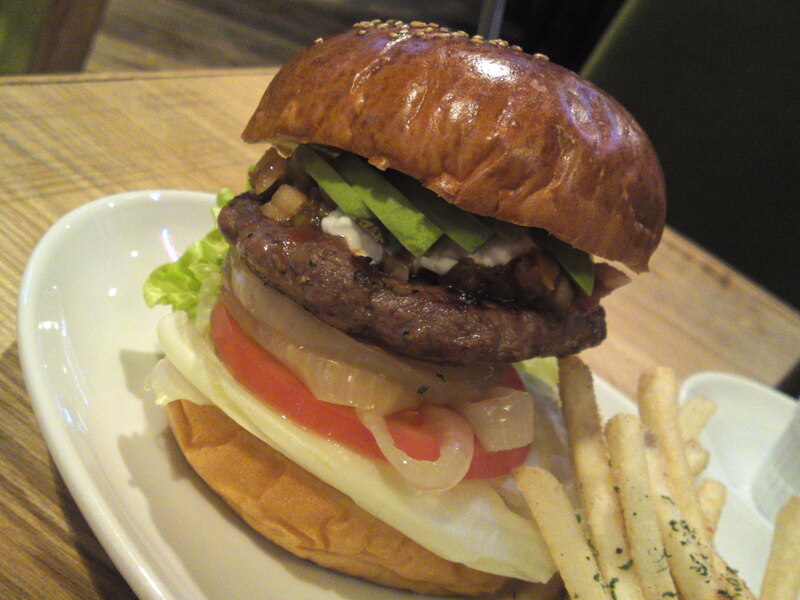 Fresh and tender avocado and more vegetables for appetizing colors! 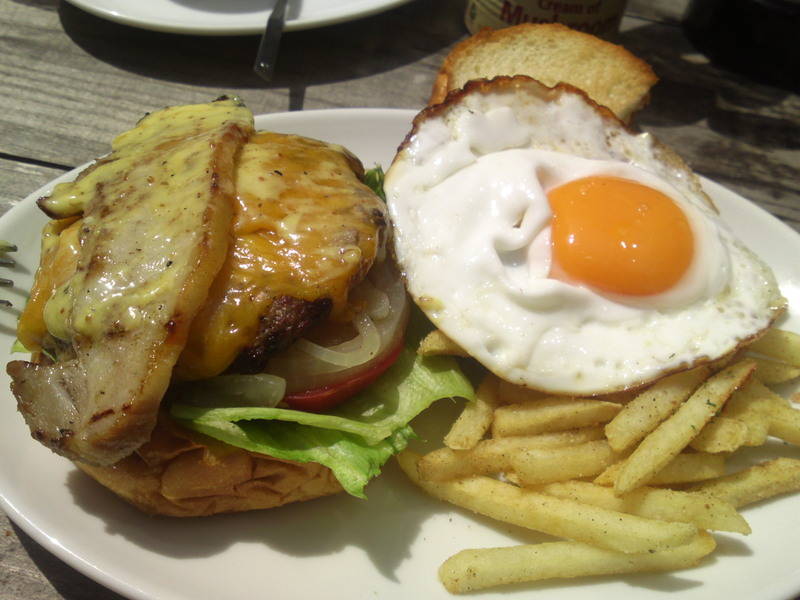 I always say that a good hamburger is a full meal: bread, Fresh and cooked vegetables, beef, bacon, cheese and egg! 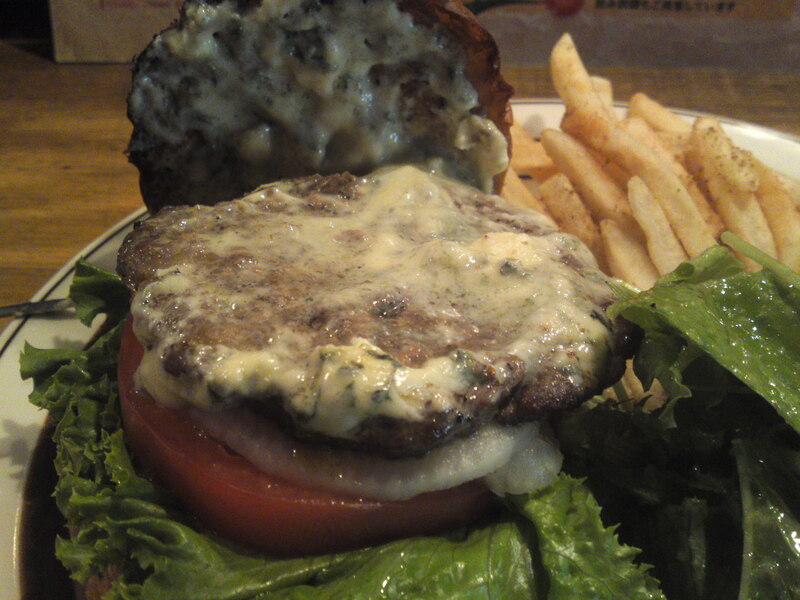 From time to time you will be able to savor limited hamburgers such as this New Zealand lamb and blue cheese hamburger! 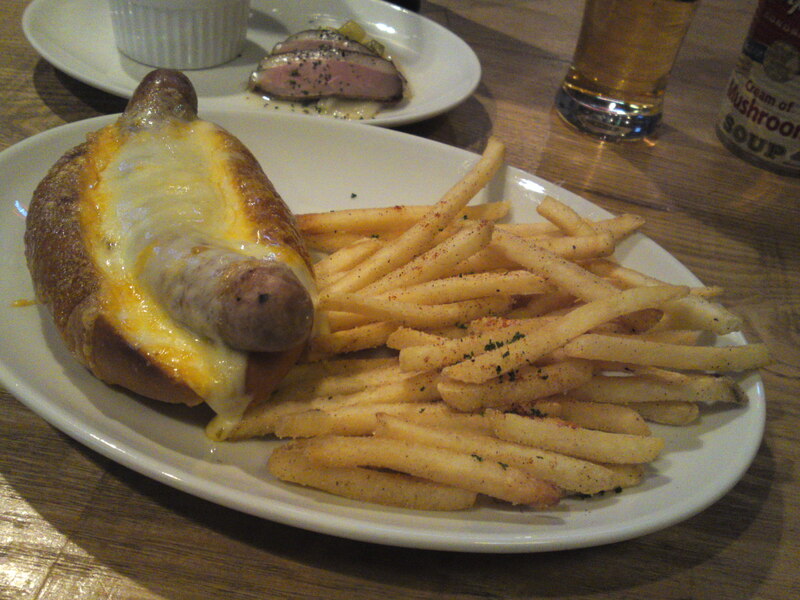 bear in mind that Tequila’s Diner is not all about superlative hamburgers but also aboutgreat tidbits such as this one-foot long Quadruple Cheese Dog! 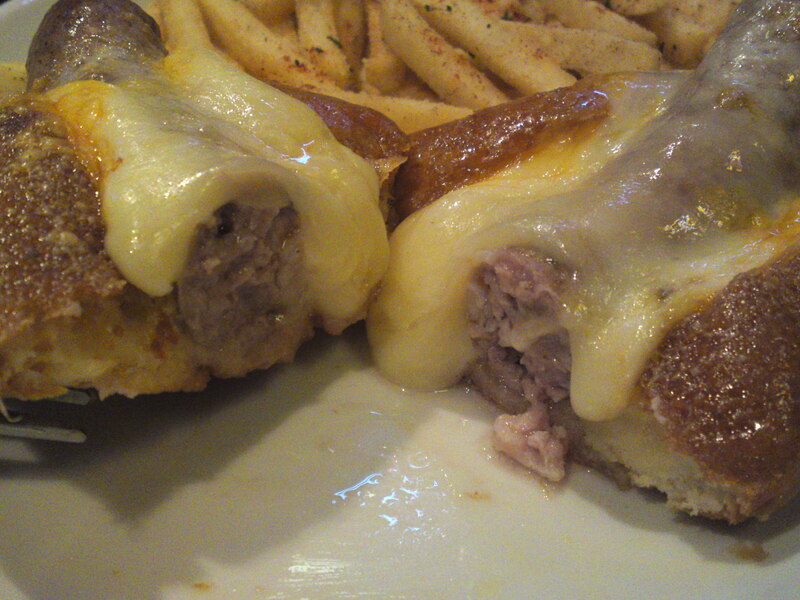 Now, the big difference is that the sausages are exclusively home-made, not some cheap canned stuff! 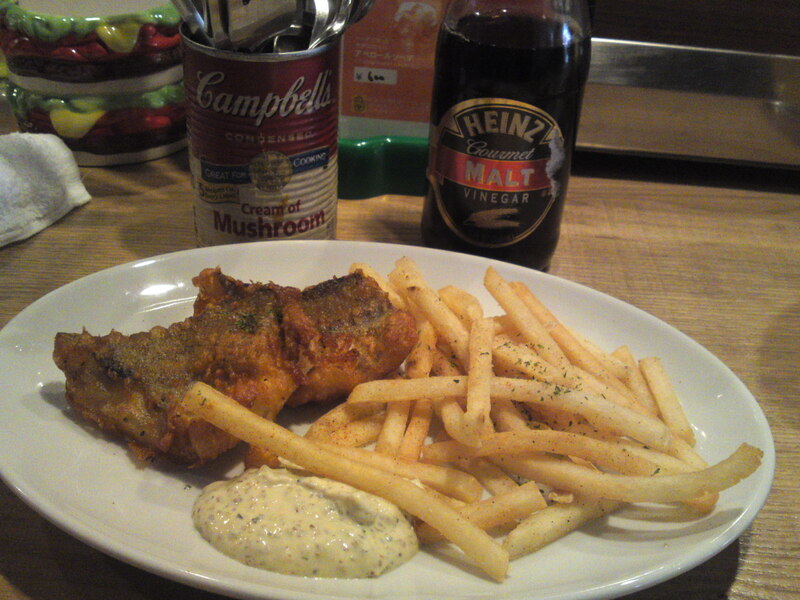 Deep-fried beer-marinated tripes! A discovery! 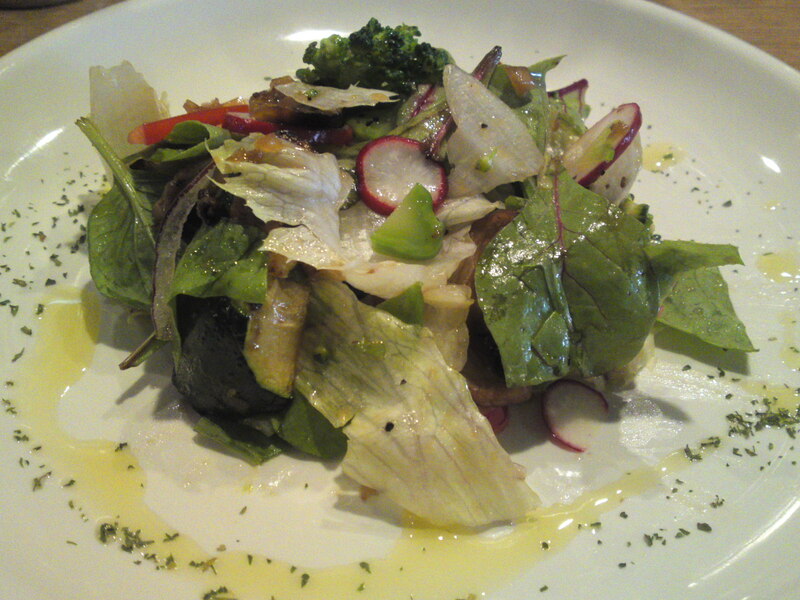 Great composite vegetable salads for well-balanced meals! 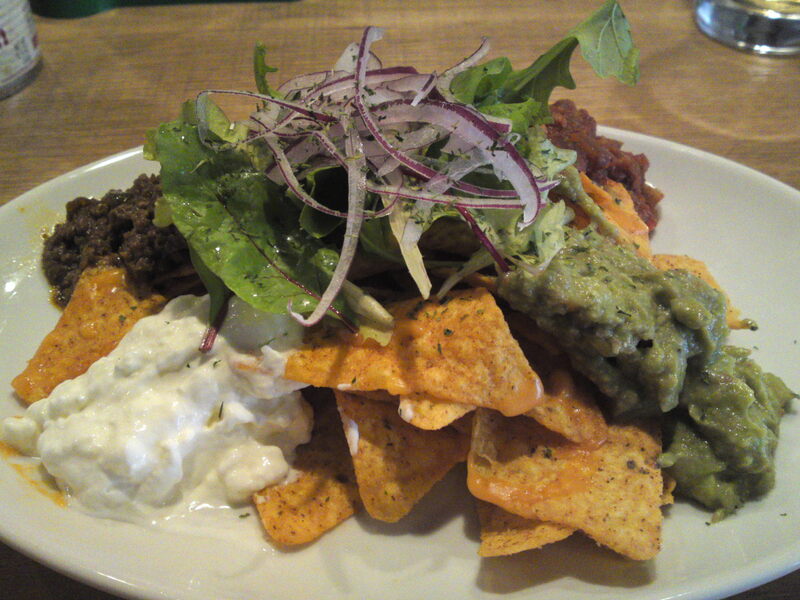 Now, their nachos are absolutely scrumptious! 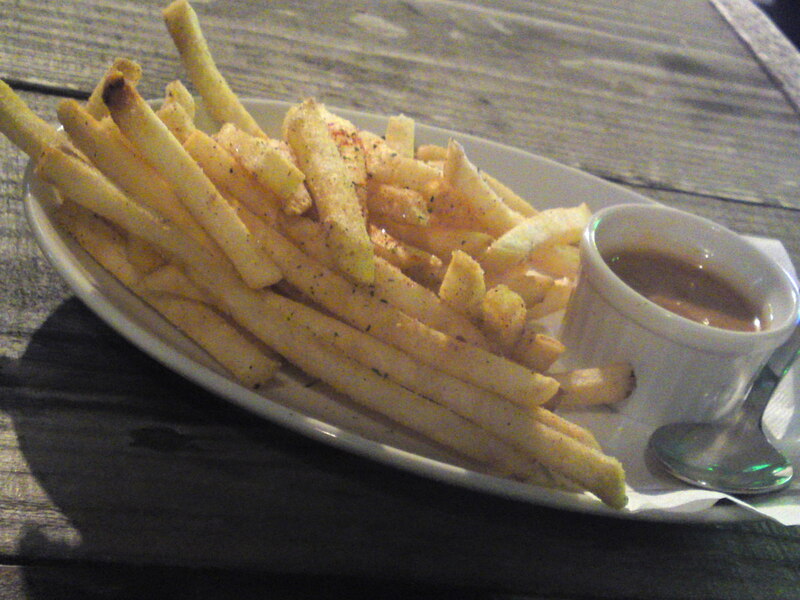 To conclude: “French Fried potatoes”! I must say they are above average! And don’t forget to mention if you want less salt! 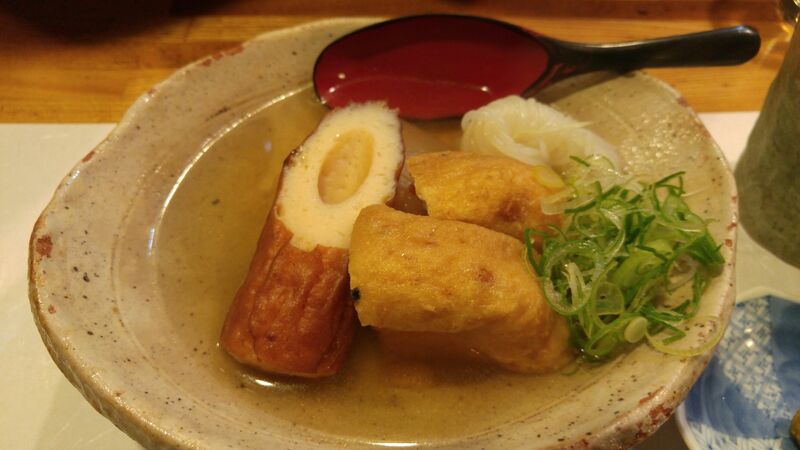 A Shizuoka Gastronomic Comfort Food: Oden! 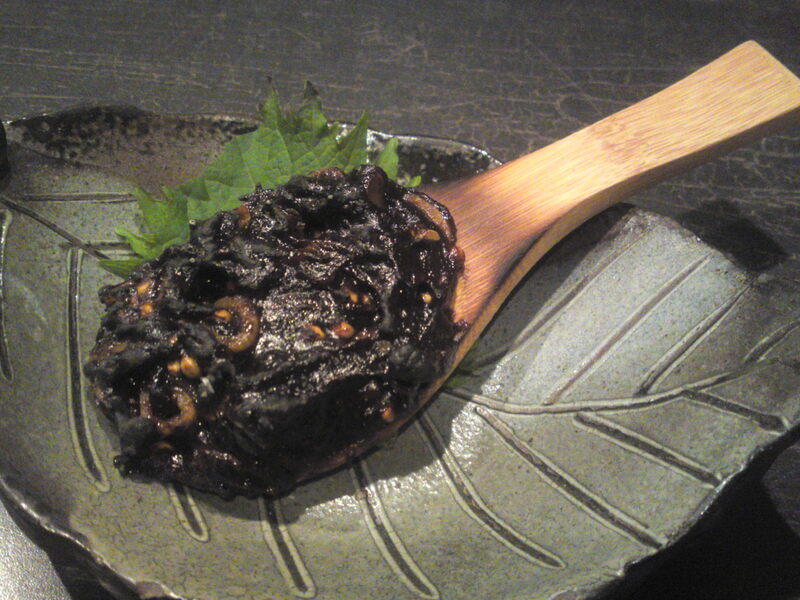 Dark Shizuoka Oden at Ogawa in Shizuoka City! 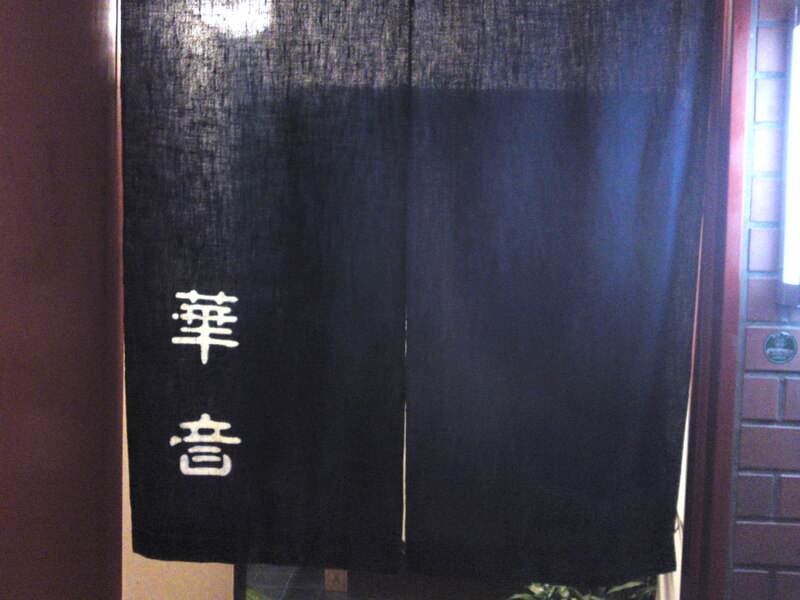 Even darker Shizuoka Oden at Taiyakiya in Ieyama, Shimada City! 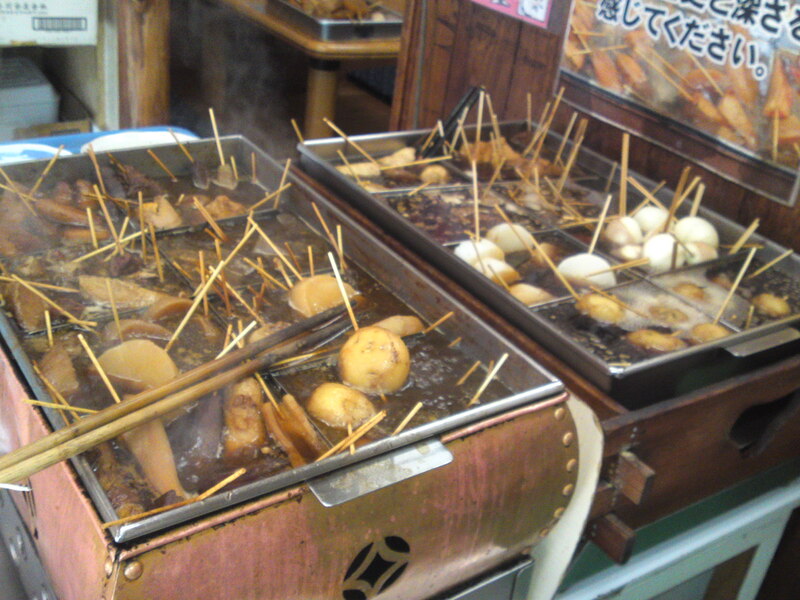 Oden in lighter Kansai-style (Western Japan) broth can also be found in Shizuoka, such as in Yasaitei in Shizuoka City! 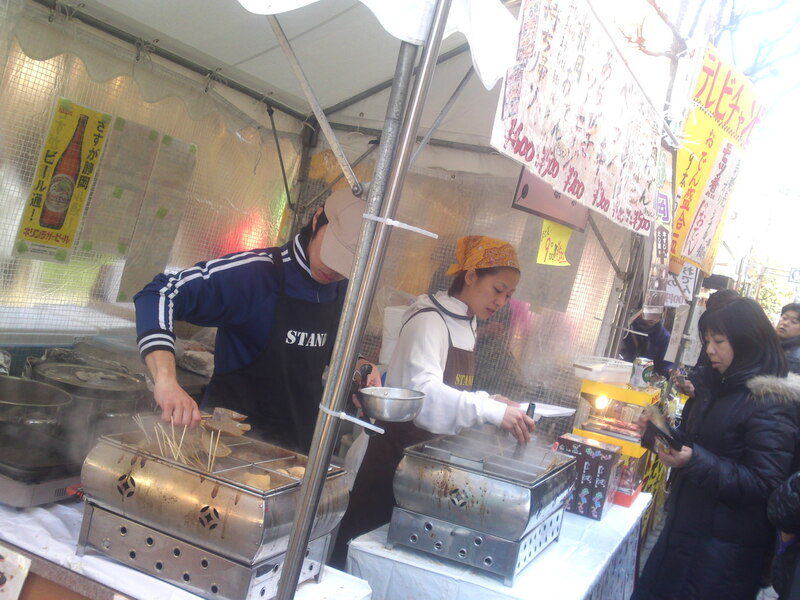 Outdoors oden stand at a Shizuoka City Oden fair in the middle of winter! 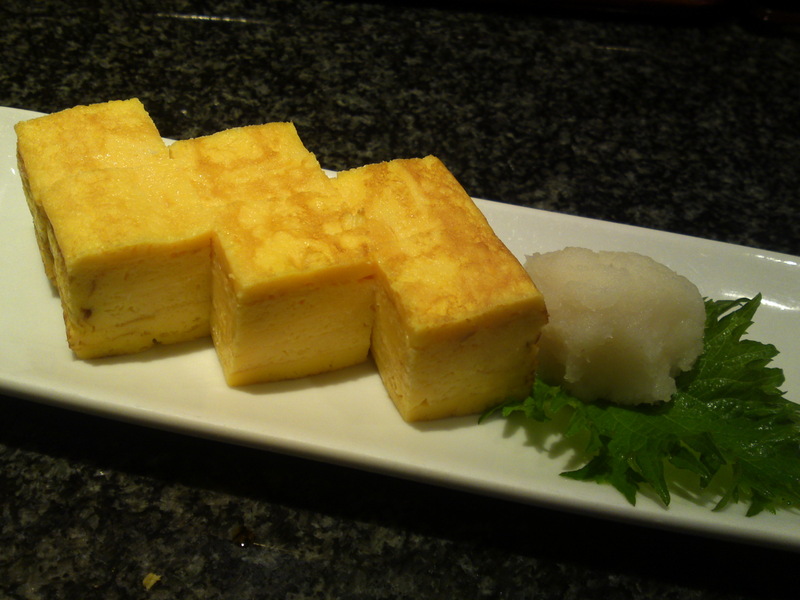 Shizuoka-style dark tofu at top! 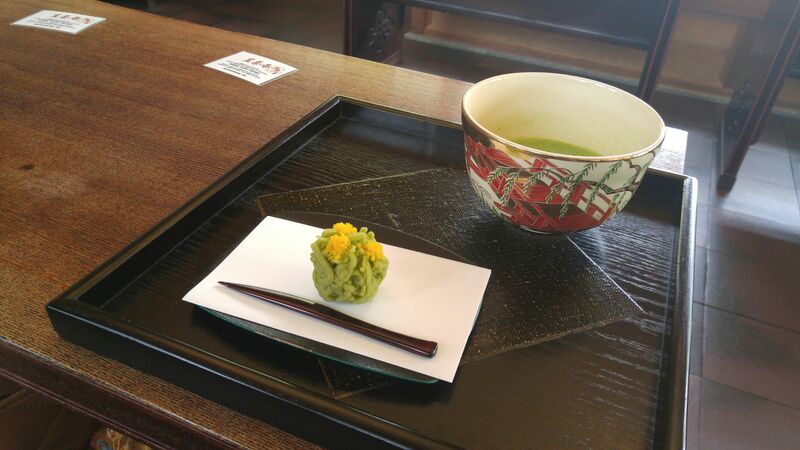 As served in Odenya in Shizuoka City! 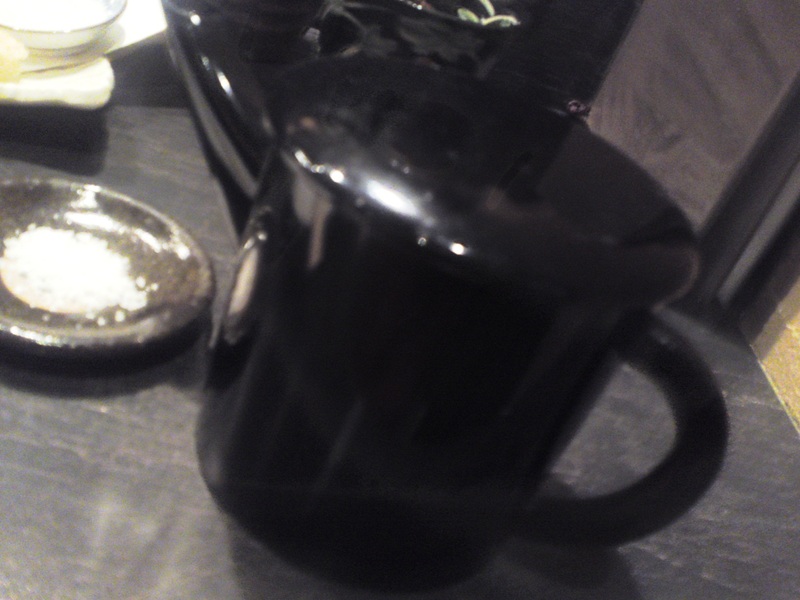 Odenya there serve a dark (and even black to visitors from Kansai who favour a light dashi!) 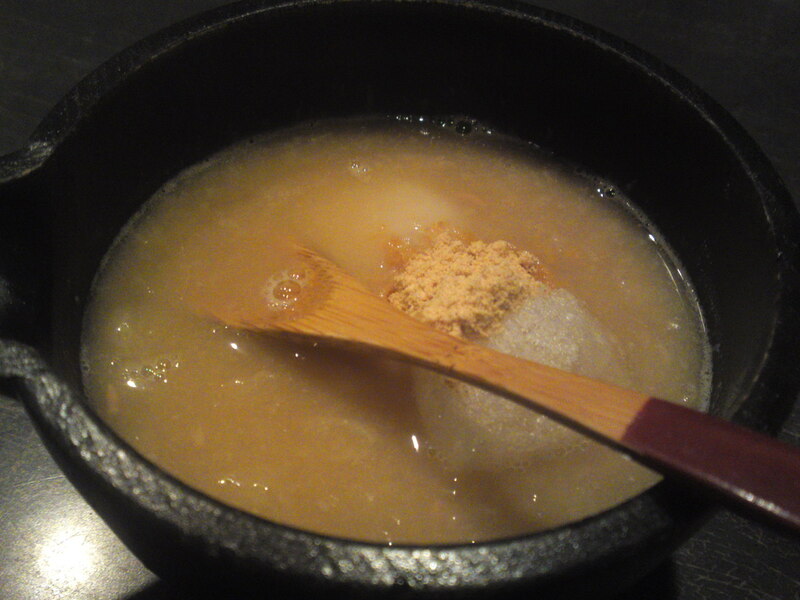 broth flavored with beef stock and strong soy sauce. 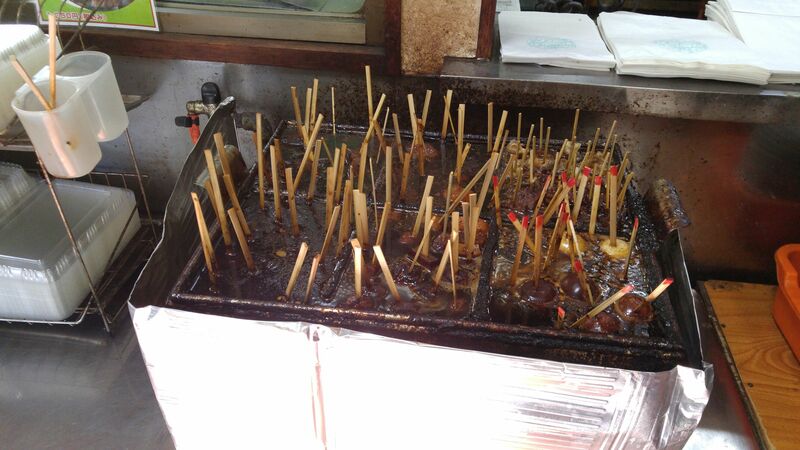 Moreover all ingredients are skewered, that for “true” Shizuoka Oden. 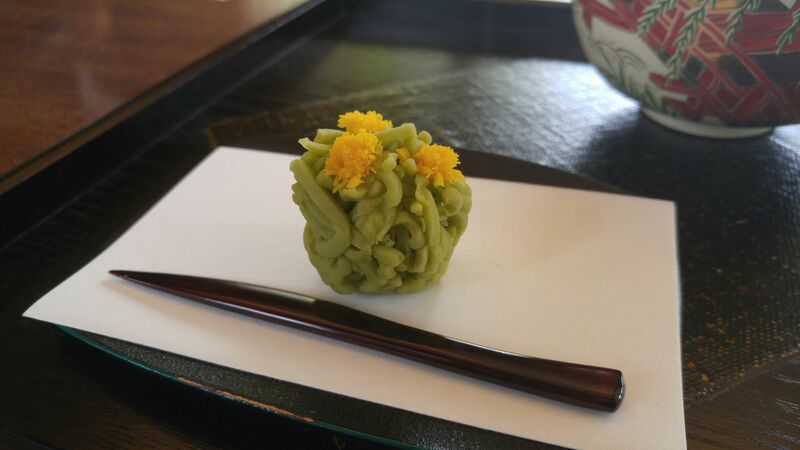 Another peculiarity is that they are served with a powdery mixture of dried ground fish (sardine, mackerel or bonito shavings) and aonori (edible seaweed). 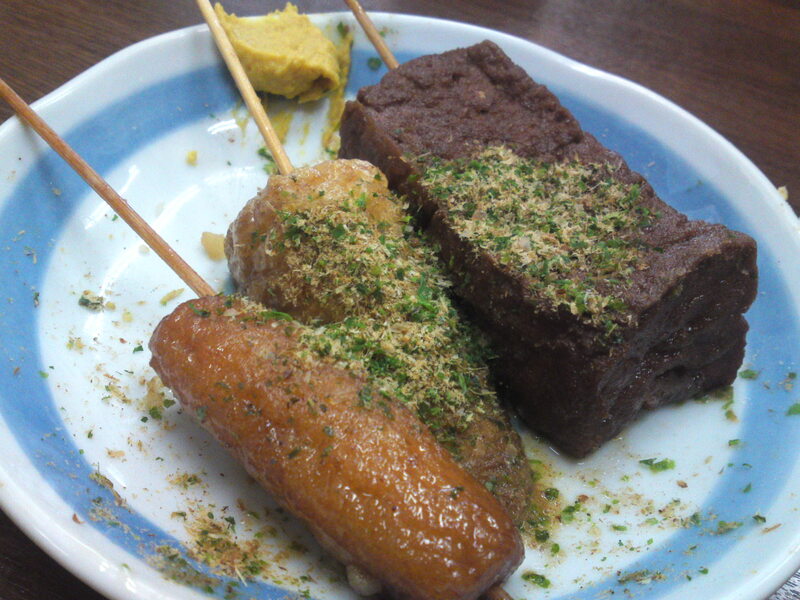 More often customers will be handed plates and allowed to take out their preferred morsels and spoon out some oden seasoning powder they will liberally sprinkle over their food. 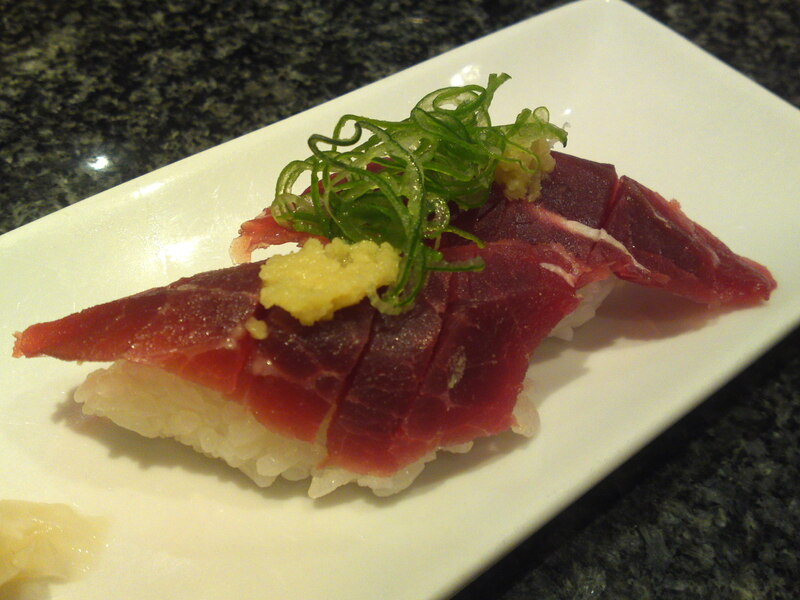 On top of this the same customers will add hot Japanese mustard from one of the pots on the table or counter. 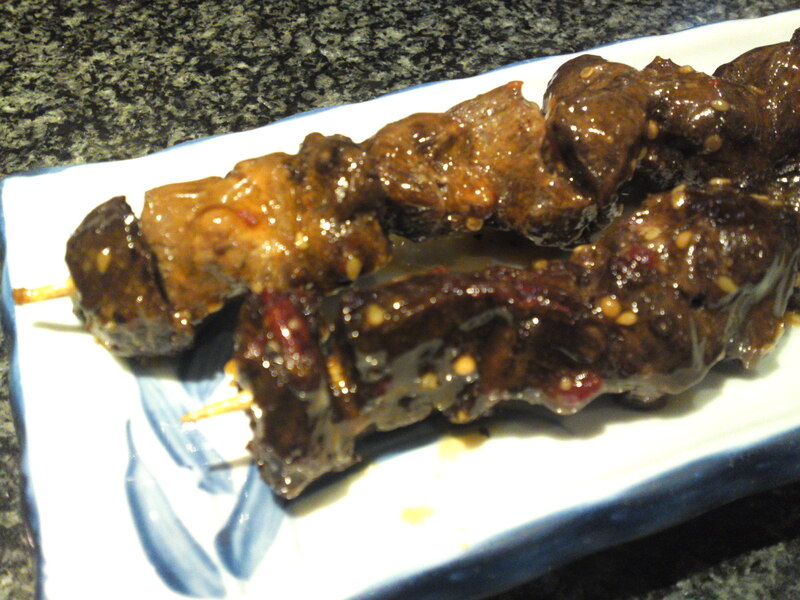 Now, if you have the occasion to stop and visit Shizuoka City (other areas in the prefecture do also have their own peculiar tidbits on offer like beef lungs in Gotenba called “fuwa”! 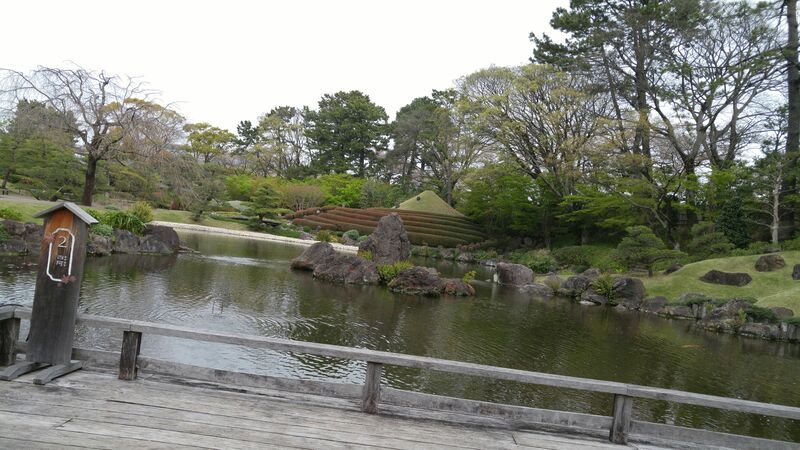 ), go to Aoba Koen Park Street. 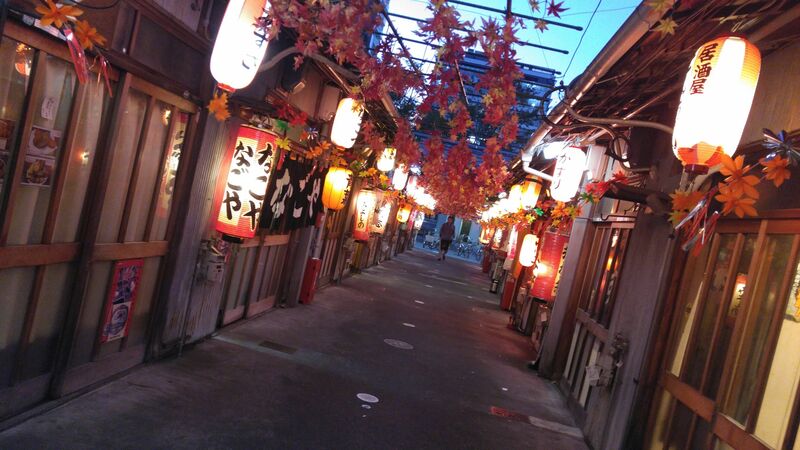 But a new hygiene law in the 1960’s forced them into moving inside alleys and corridors between other buildings where they became Aoba Oden Alleys. 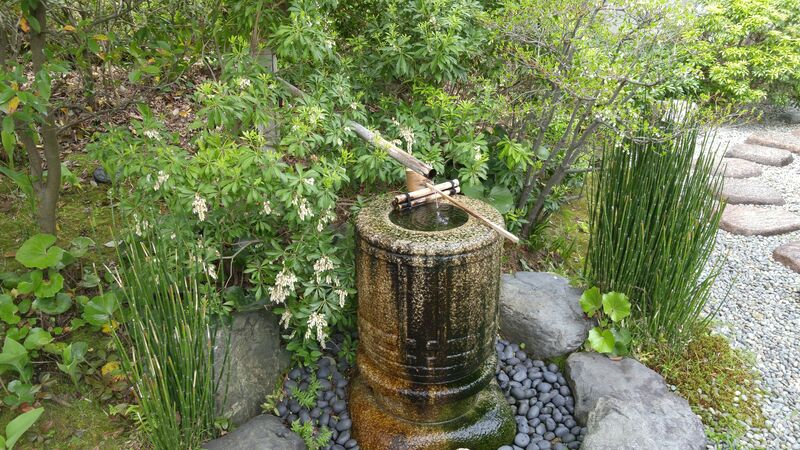 Every year a Shizuoka Oden Festival is held in mid-February in the Aoba Koen and Gofuku-cho area for the pleasure of all, adults and children, day or night, Japanese or expats! 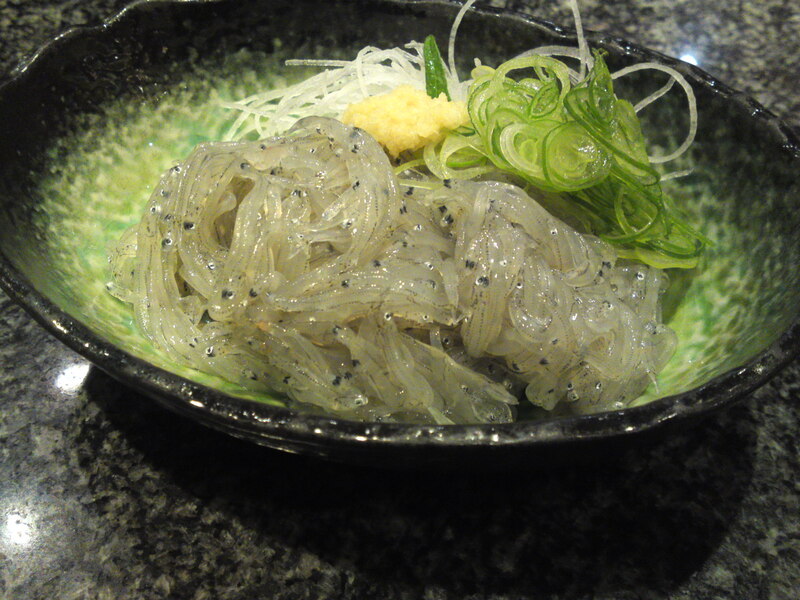 Soba: Shizuoka Native Buckwheat Noodles at Teuchi Soba Tagata in Shizuoka City! 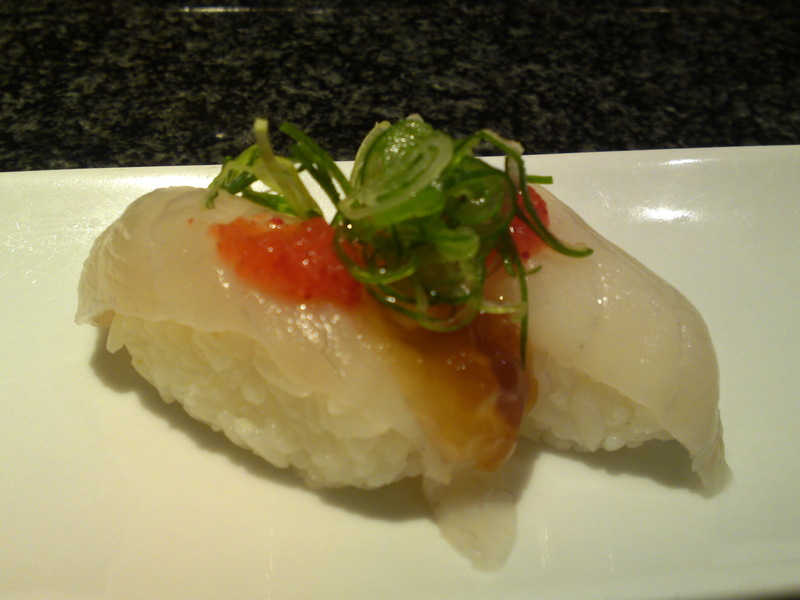 Strong points: Only native buckwheat from Shizuoka and rest of Japan used. 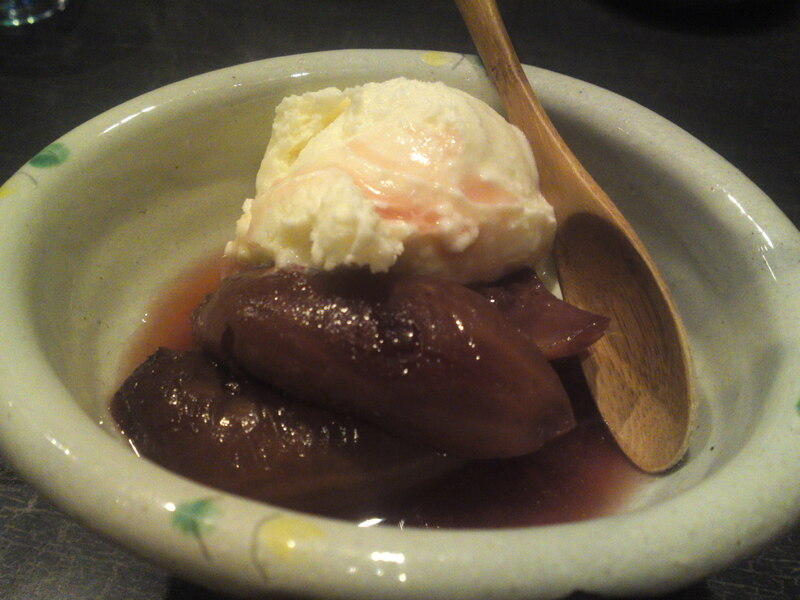 Great use of local seasonal ingredients. 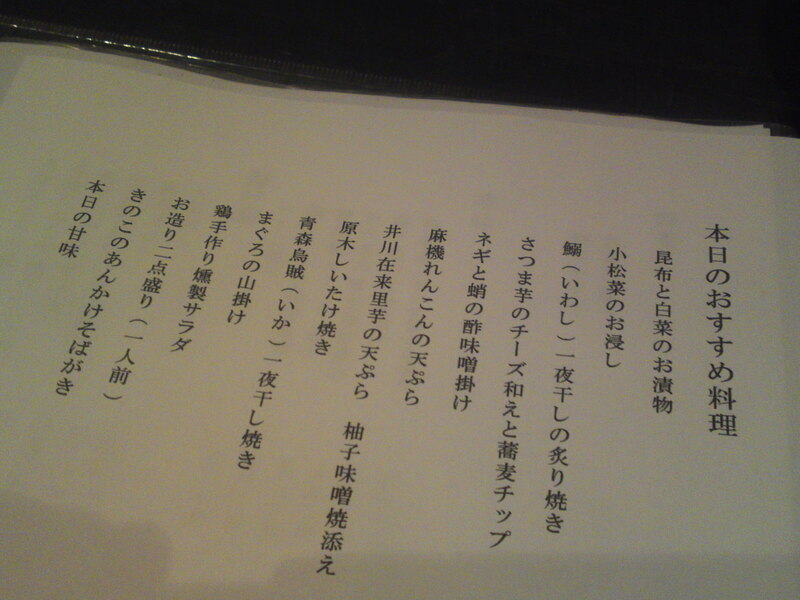 Great sake and shochu list. 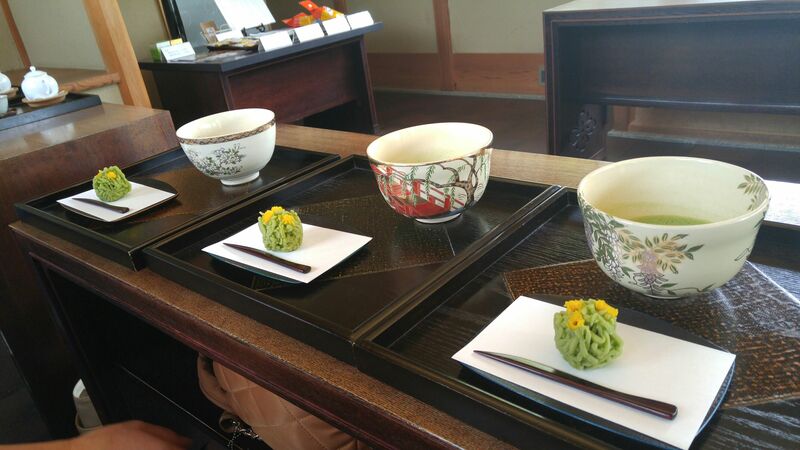 Soba or buckwheat noodles is one of those underrated products in Shizuoka Prefecture which ought to deserve more attention especially when you take in account that it has produced its own soba for immemorable times well before Tokugawa Ieyasu came to love them so much when he retired to Sumpu/Shizuoka in the beginning of the 17th Century! 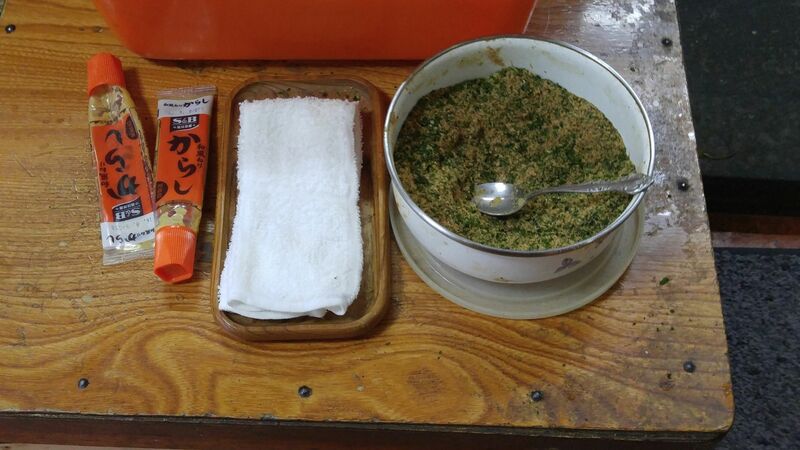 If one needed a single reason for patronizing Teuchi Soba Tagata would be that Chef Osamu Tagata/田形治さん not only uses exclusively Japanese native buckwheat/zairaishu soba/在来種蕎麦 from Shizuoka Prefecture and elsewhere in the country but also takes a rare pleasure extolling about his soba and other cuisine to whoever is interested or might ask! 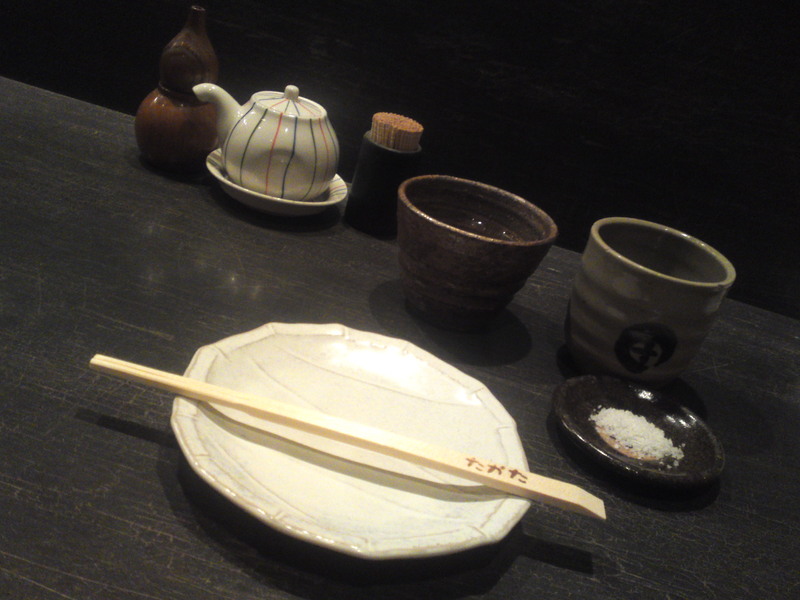 Of course I ordered “mori soba” made with native buckwheat grown in the mountains of Iwata in Central Shizuoka prefecture! 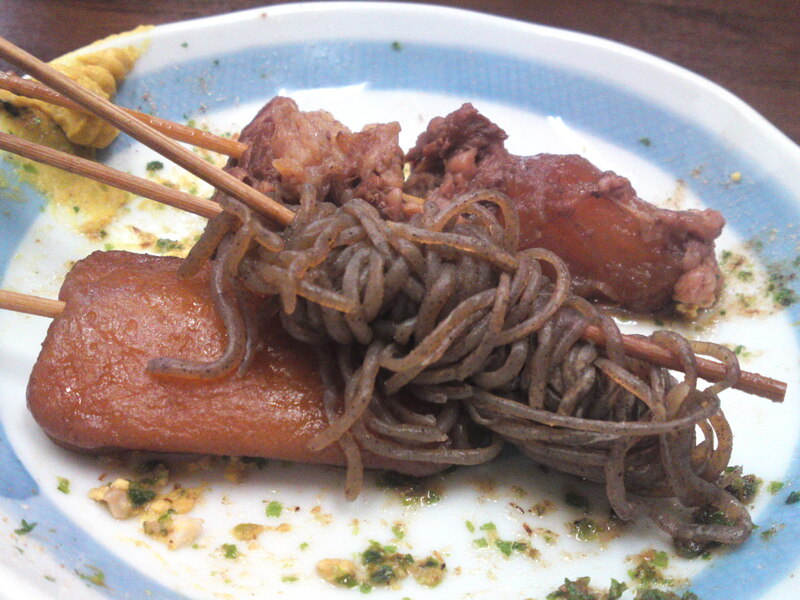 But I can assure it is not all about soba but more true Japanese gastronomy! 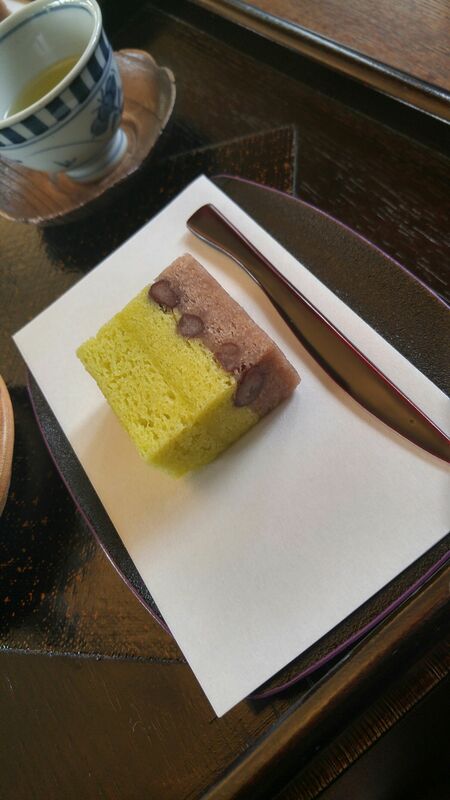 You could always order a set menu but poring through the menu and choosing tidbits according to your whims is far more fun! 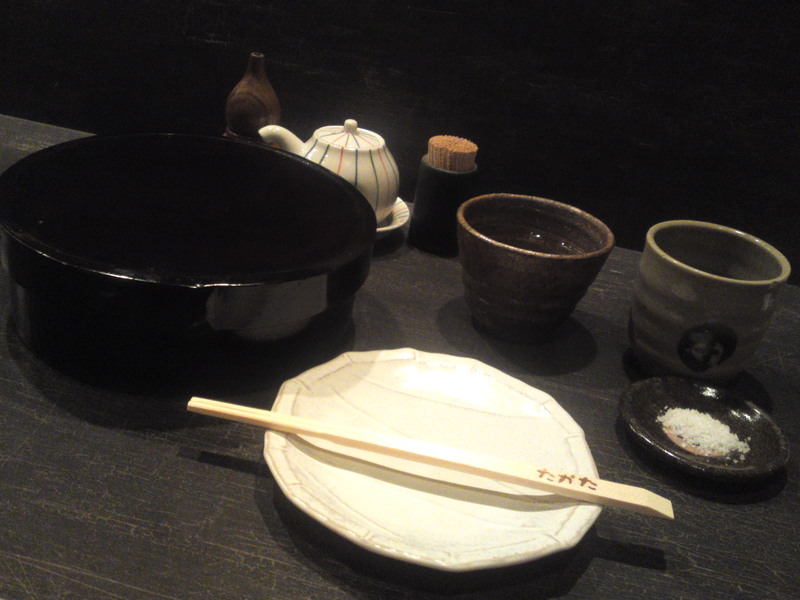 What I enjoy at soba restaurants is looking at all the utensils served a few at a time, a good indication of the level of the establishment! 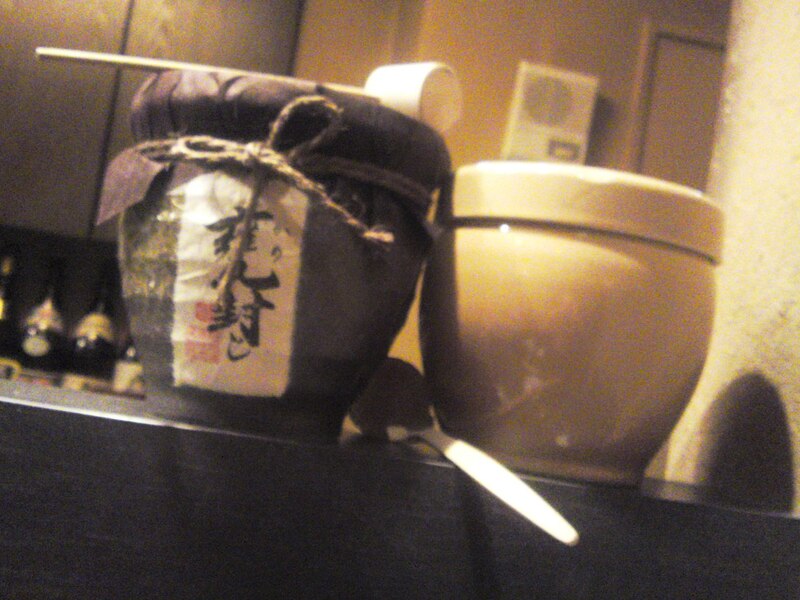 On my next visit I will have to ask what secret brew is hidden inside that pot! 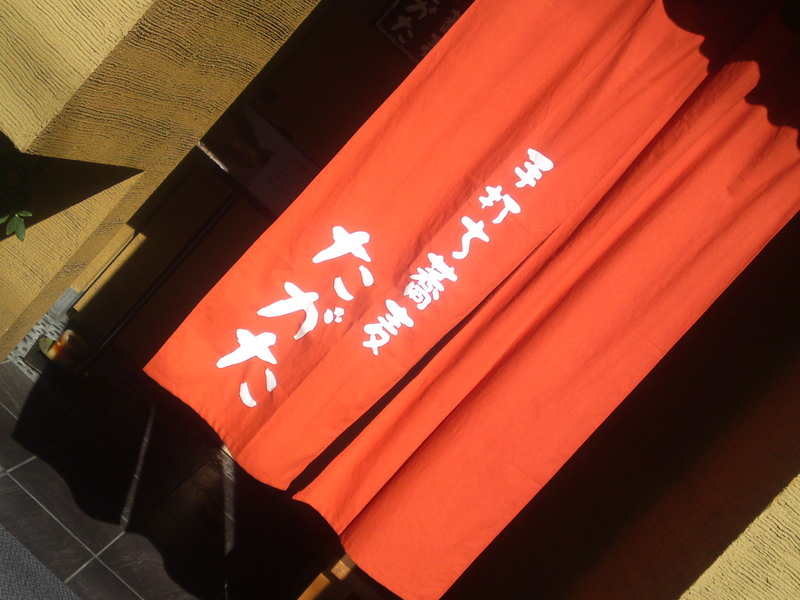 The “mori soba” have come! 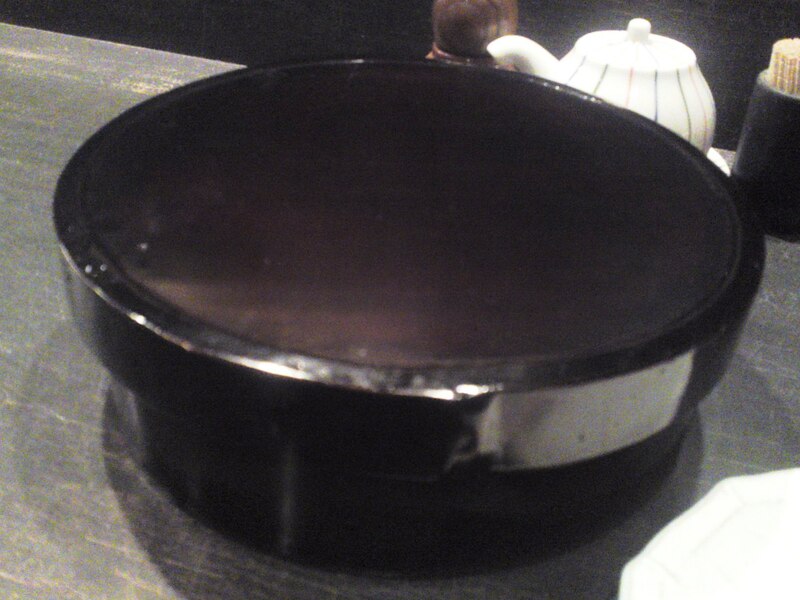 Now, this lacquered box is a “mempa bento box” made only with cherry wood from Ikawa in the north of Shizuoka City! 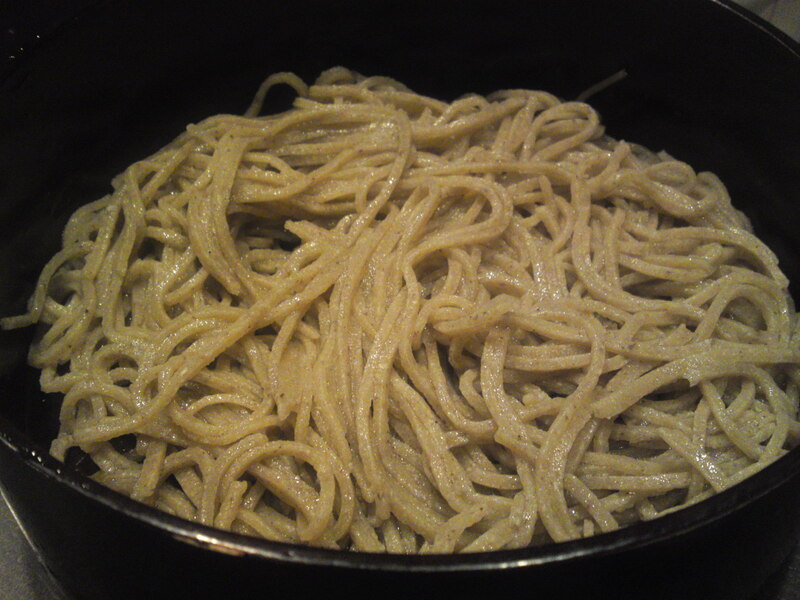 Soba made with native buckwheat from Ikawa, Shizuoka City as a “juwari/100%”! 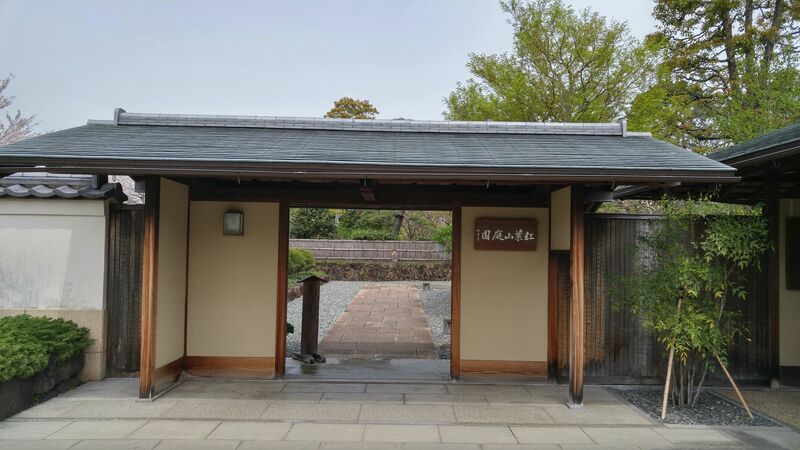 Actually, Teuchi Soba Tagata in Shizuoka City is not only famed for their soba and cuisine but also for the superb sake (including Shizuoka, of course) and its beautiful shochu which also includes a beauty from Shizuoka Prefecture! 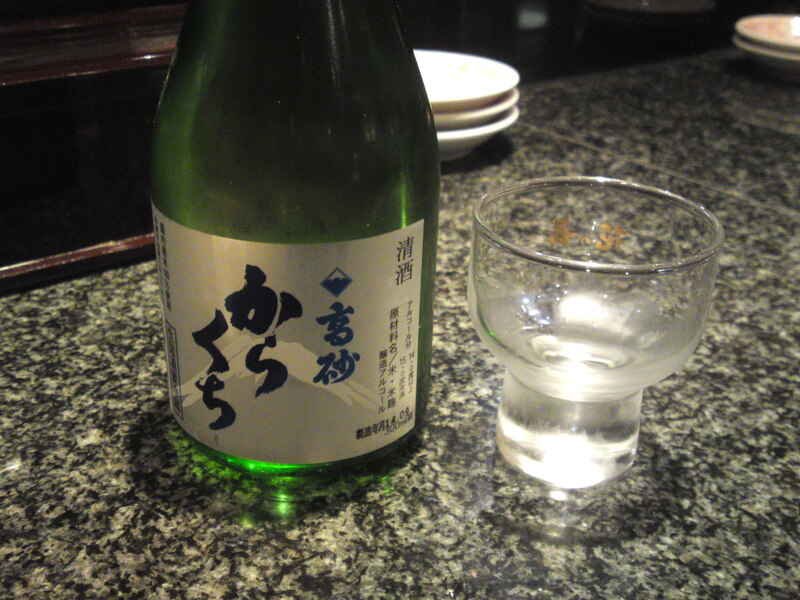 The above is sake brewed by Haginishiki Brewery in Shizuoka City! 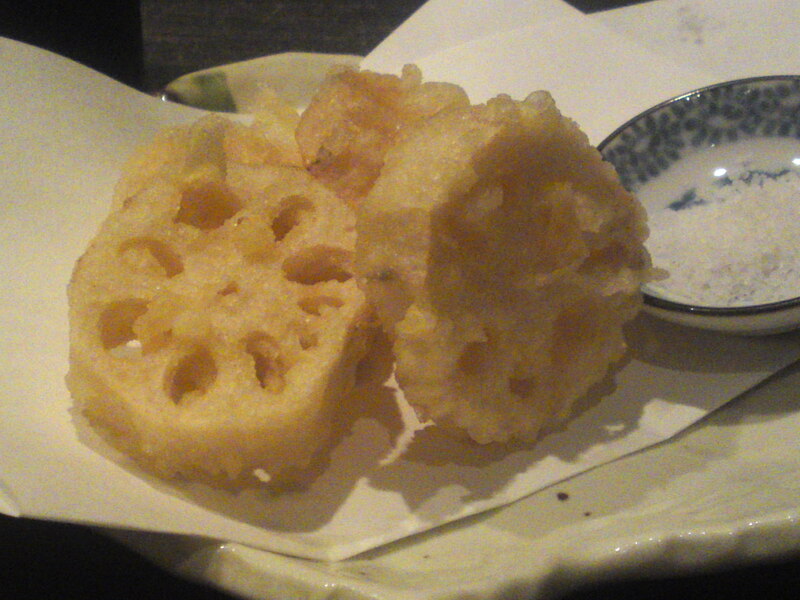 Deep-fried rekon/lotus roots grown in Asabata, Shizuoka City! 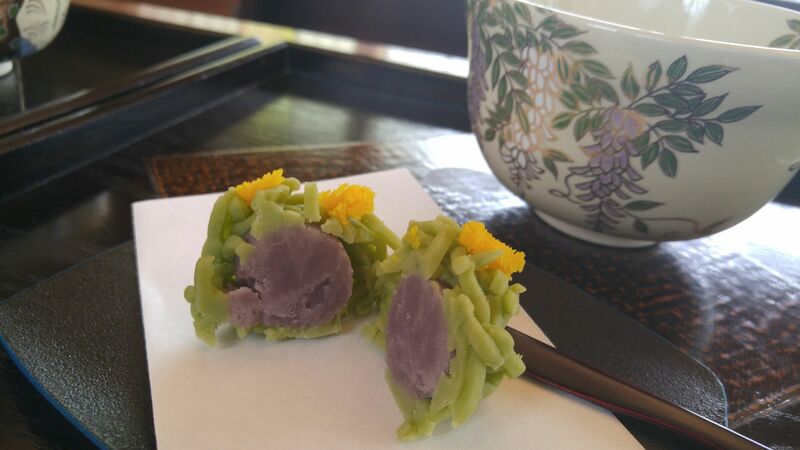 Now, this is a bit special: these sato imo/taro roots are a native variety grown for centuries in Ikawa! 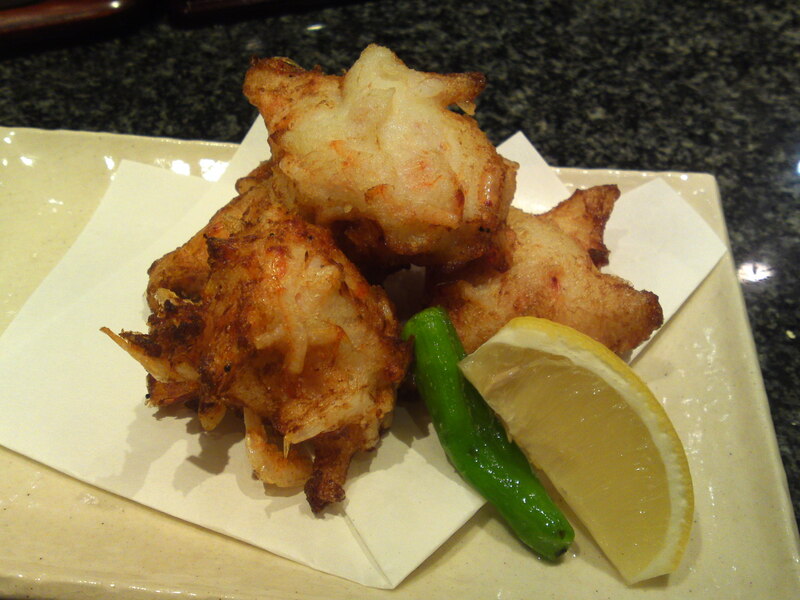 Served as tempura with a special miso paste, a must try! 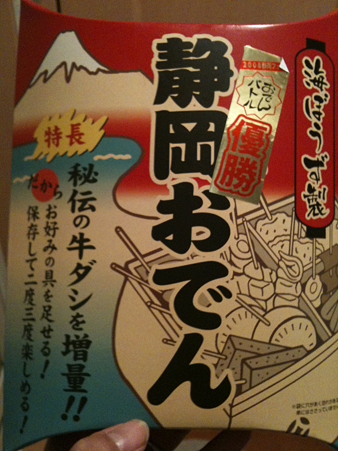 Soba yu/soba soup to mix with whatever soupstock/soba sauce you have left and drink to wash down your meal! 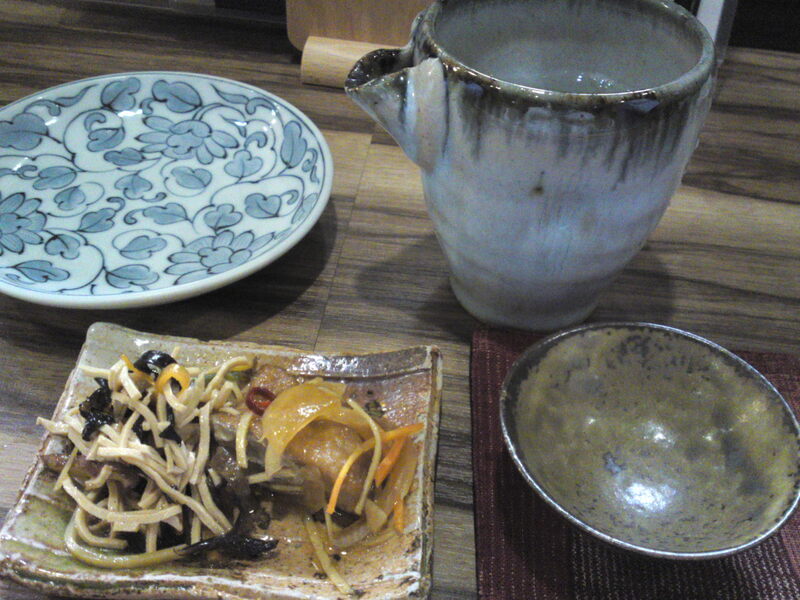 I had to try another favorite: soba miso yaki! 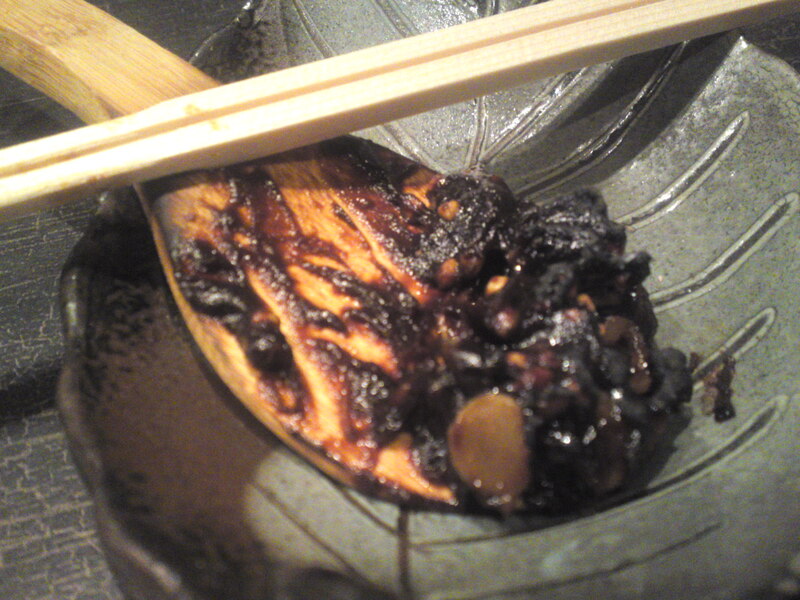 Buckwheat seeds grilled with miso paste! 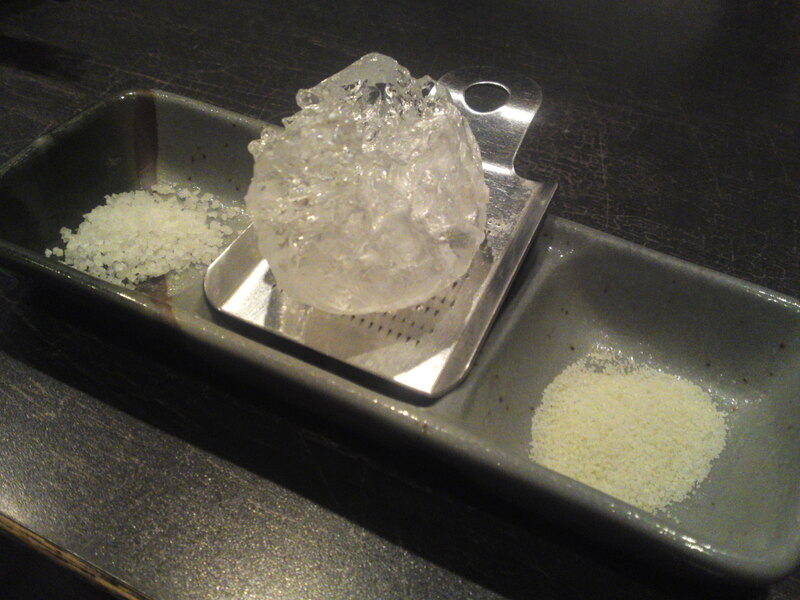 Three different salts for the tempura! 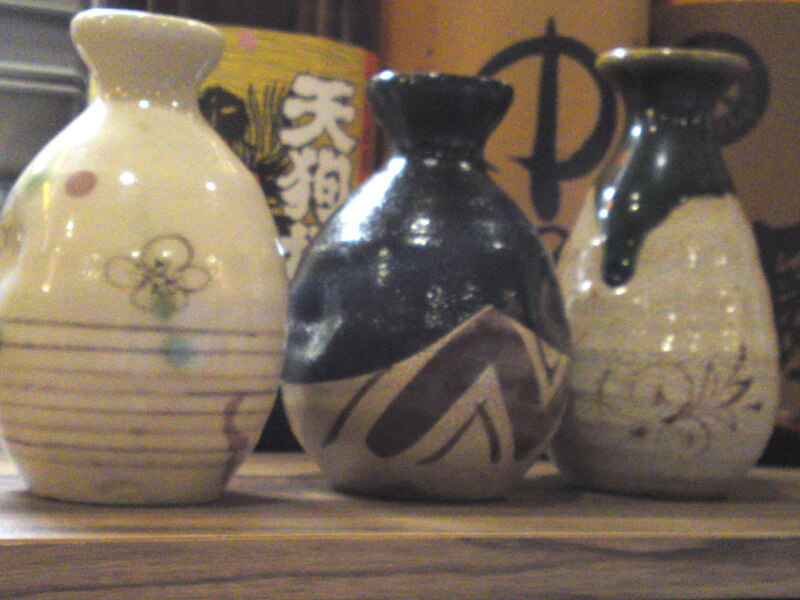 The middle one is pure rock salt! 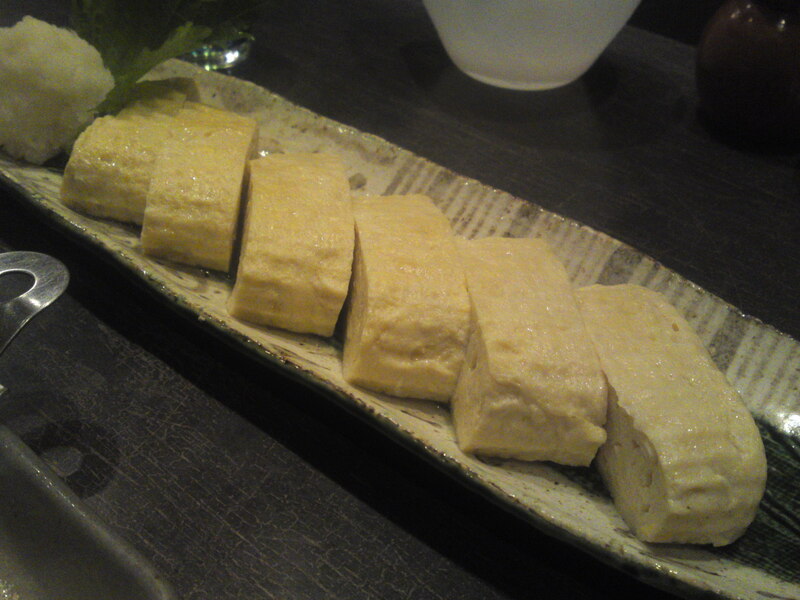 Tamagoyaki made with dashi stock soup!! 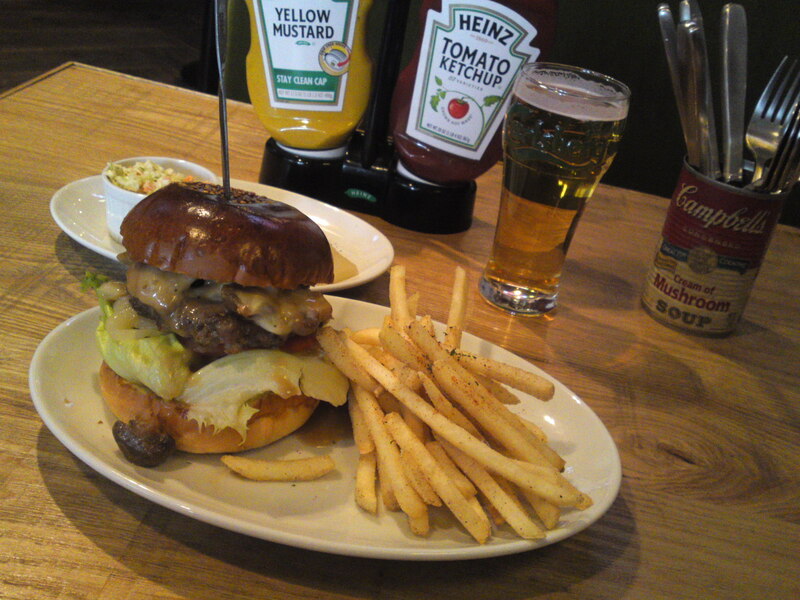 And a great plate (for two!) 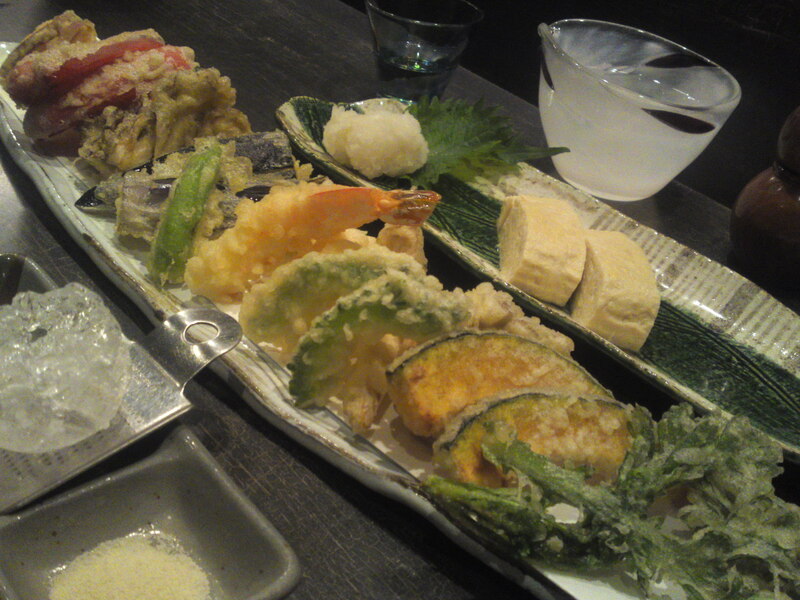 of seasonal vegetables and seafood tempura! 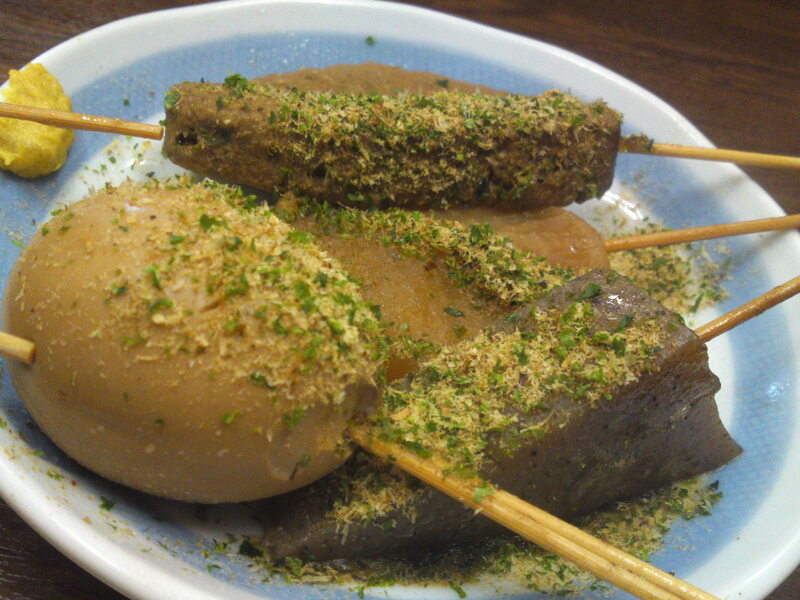 And a great hot Japanese dessert with kinako, o mochi and beans! 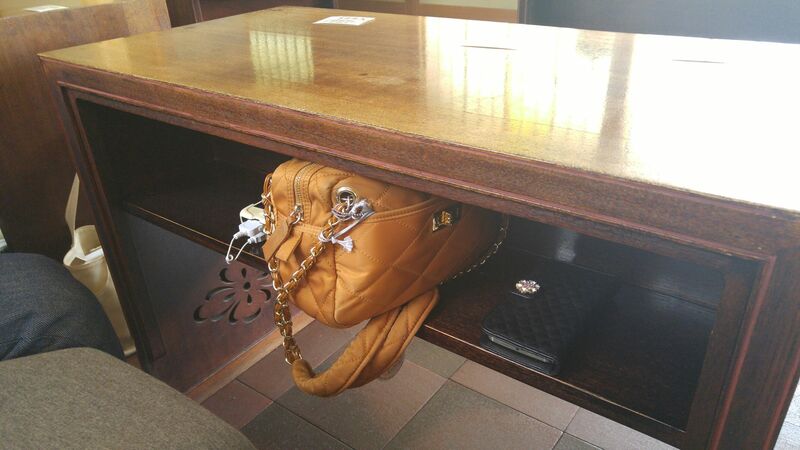 The last details are so important!